Cell differentiation is controlled by individual transcription factors (TFs) that together activate a selection of enhancers in specific cell types. How these combinations of TFs identify and activate their target sequences remains poorly understood. Here, we identify the cis-regulatory transcriptional code that controls the differentiation of serotonergic HSN neurons in Caenorhabditis elegans. Activation of the HSN transcriptome is directly orchestrated by a collective of six TFs. Binding site clusters for this TF collective form a regulatory signature that is sufficient for de novo identification of HSN neuron functional enhancers. Among C. elegans neurons, the HSN transcriptome most closely resembles that of mouse serotonergic neurons. Mouse orthologs of the HSN TF collective also regulate serotonergic differentiation and can functionally substitute for their worm counterparts which suggests deep homology. Our results identify rules governing the regulatory landscape of a critically important neuronal type in two species separated by over 700 million years. All cells in the body essentially share the same DNA, despite looking very different and playing a range of roles. The reason that cell types are so different from one another is because of the way they interpret the DNA. Each different type of cell uses a specific subset of the genes within the genome. The part of the DNA that controls which cell will use which genes and when is called the regulatory genome; this DNA is not translated into proteins. The regulatory genome is much less well understood than the protein-coding genome. At present, when a new species is discovered, it is often possible to sequence its DNA and deduce where the protein-coding genes are and what roles they might play. However, it is not yet possible to do the same for the regulatory genome. Finding a way to do this is an important step towards understanding when and where each of the organism’s genes is active. Lloret-Fernández, Maicas, Mora-Martínez et al. focused on the regulatory genome of nerve cells that use a chemical messenger called serotonin in the nematode worm Caenorhabditis elegans. First, they studied mutations in six genes that code for transcription factors that are active in this cell type. Transcription factors are proteins that identify and bind to specific regions of the genome to control the activity of nearby genes. These six mutants failed to correctly activate the regulatory genome of this nerve cell, which was measured using a genetic approach that caused the nerves to glow green under a microscope when the regulatory genome was active. Further experiments then confirmed that all six transcription factors must act together to identify and activate the regulatory genome in this particular nerve cell. The fact that the DNA sites that these transcription factors bind are clustered close to each other means they can be used as a marker to help decode the active regulatory genome of this class of nerve cell. This is a small step towards understanding how the regulatory genome works. Comparisons with similar nerve cells from mammals found that the equivalent transcription factors have the same role, suggesting that they may be broadly conserved across species. Understanding the regulatory genome better could eventually lead to new treatments for certain genetic conditions, as many mutations associated with diseases appear outside the protein-coding genome. Cell identities are characterized by the expression of specific transcriptomes that are activated through cell-type-specific regulatory landscapes. Large efforts have been made to identify functional enhancers in different tissues and developmental stages. The approaches include the occupancy of combinations of transcription factors (TFs), identifying DNA regions displaying open chromatin states, analyzing specific histone marks and assessing enhancer function by transgenesis in vivo (Junion et al., 2012; Mo et al., 2015; Nord et al., 2013; Pattabiraman et al., 2014; Visel et al., 2013; Zinzen et al., 2009). These studies have revealed a highly dynamic organization of active enhancers that change depending on the cell type and developmental stage. However, to date, it is unclear what features of the DNA sequences distinguish enhancer regions from the rest of the genome. The identification of such features is critical both for understanding fundamental biological processes such as cell fate specification, as well as for biomedicine, given that most disease-associated mutations are thought to be located within regulatory sequences (Mathelier et al., 2015; Nishizaki and Boyle, 2017). TFs are the main regulators of enhancer function. Each enhancer is bound by specific combinations of TFs that will either activate or repress transcription (Reiter et al., 2017). The distribution of TF-binding sites (TFBS) has been studied in detail in only a few enhancers. For example, a study of sparkling, a specific enhancer of the Drosophila Pax2 gene, revealed it to be densely packed with TFBS that required specific arrangements for its functionality (Swanson et al., 2010). However, these one-by-one approaches are not able to reveal any general molecular logic underlying cell-type-specific regulatory landscapes. Chromatin immunoprecipitation combined with deep sequencing (ChIP-seq) has been used to generate genome-scale binding profiles of specific TFs. It is now clear that TF-binding profiles are dynamic during cell differentiation and vary in related species (Garber et al., 2012; Heinz et al., 2010; Khoueiry et al., 2017; Nord et al., 2013; Stefflova et al., 2013; Wilczyński and Furlong, 2010; Zinzen et al., 2009). However, it is unclear what distinguishes TFBS actually bound by the TF from those that are unoccupied. Moreover, despite the fact that only a small fraction of bound TFBS are located in enhancers (Kwasnieski et al., 2014; Pattabiraman et al., 2014; Whitfield et al., 2012), the molecular organization that distinguishes functional enhancers from the rest of non-coding regions is still unknown. Collective binding of several TFs is emerging as an important feature that distinguishes TFBS at functional enhancers from other genomic regions bound by individual TFs (Junion et al., 2012; Khoueiry et al., 2017; Mazzoni et al., 2013; Zinzen et al., 2009). However, it is still unclear how these combinations of TFs are collectively recruited to and activate cell-type-specific regulatory landscapes. The study of the transcriptional regulatory mechanisms underlying neuronal subtype specification in vivo in complex model organisms, such as rodents, is a challenging task. Here, we take advantage of the simple model organism C. elegans to study neuron type specification in vivo. C. elegans is especially suitable for transcriptional regulatory studies because its cell lineage is fully described, it is easy to genetically manipulate and its genome is very compact (despite containing a similar number of genes to the human genome) (Gerstein et al., 2010). In this work, we focus on the study of the transcriptional regulatory logic of serotonergic neurons. Serotonergic neurons are present in all eumetazoan groups and are universally defined by their ability to synthesize and release serotonin (5HT) (Flames and Hobert, 2011). They regulate multiple processes and their dysfunction has been linked to bipolar disorder, depression, anxiety, anorexia and schizophrenia (Deneris and Wyler, 2012; Mathelier et al., 2015). Several TFs are known to be involved in mammalian serotonergic differentiation (Deneris and Wyler, 2012). However, little is known about their function in the regulation of specific serotonergic neuron enhancers. Here, we focus on this clinically relevant and highly conserved neuronal subtype, and exploit the amenability of C. elegans to unravel the rules governing the activation of the serotonergic transcriptome. 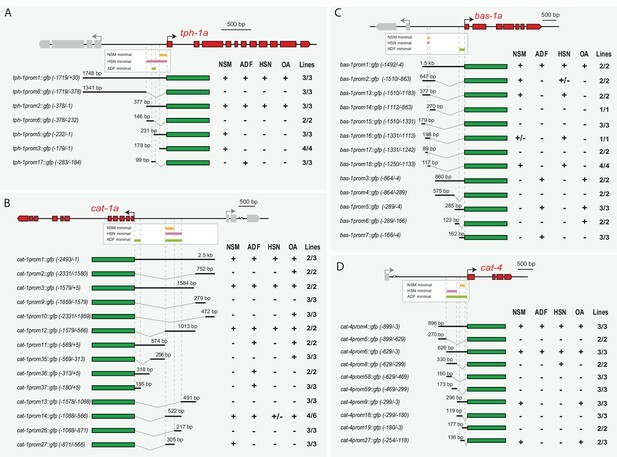 This work reveals the phylogenetically conserved action of a collection of TFs on the selection of a specific regulatory landscape from the genome and allows for the identification of neuron subtype specific functional enhancers merely based on the presence of the TF collective regulatory signature. Serotonergic neurons are characterized by the coordinated expression of a battery of phylogenetically conserved enzymes and transporters known as the 5HT pathway genes (Figure 1A). C. elegans adult hermaphrodites contain three functionally distinct serotonergic neuron subclasses: the NSM neurosecretory neuron, the ADF chemosensory neuron and the HSN motor neuron (Figure 1B), which arise from different progenitors and, with the exception of the 5HT pathway genes, express different effector genes (Figure 1—figure supplement 1). The HSN neuron is, by far, the best characterized, thus we focused on dissecting the transcriptional rules governing the differentiation of this subclass. Transcription factors from six different TF families are required for HSN terminal differentiation. (A) Phylogenetically conserved serotonin biosynthetic pathway. C. elegans protein names appear in black case, mammalian in grey. AADC: aromatic L-amino acid decarboxylase; GCH: GTP cyclohydrolase; TPH: tryptophan hydroxylase; Trp: tryptophan; VMAT: vesicular monoamine transporter; 5HTP: 5-hydroxytryptophan; 5HT: serotonin. (B) C. elegans hermaphrodite serotonergic system is composed of three subclasses of bilateral neurons (NSM, ADF and HSN, L: left, R: right). See Figure 1—figure supplement 1 for expression profiles of serotonergic subclasses. (C) Micrographs showing HSN 5HT staining and tph-1::gfp reporter expression defects of ast-1(ot417), unc-86(n846), sem-4(n1971), hlh-3(tm1688), egl-46(sy628) and egl-18(ok290) mutant animals (quantified in E). Scale bar: 5 μm. (D) Micrographs showing expression defects in the K+/Cl- cotransporter kcc-2::gfp reporter, a terminal feature of HSN not related to 5HT signaling, and normal expression of the extracellular matrix gene kal-1, indicating HSN is still present. (E) Heatmap summary of single TF mutant characterization. Statistically significant expression defects compared to wild type are indicated with a black frame. flp-19: FMRF-like peptide; ida-1: Tyr phosphatase-like receptor; lgc-55: amine-gated Cl- channel; nlg-1: neuroligin; rab-3: ras GTPase; unc-17: vesicular acetylcholine transporter; unc-40: netrin receptor. n.a: not analyzed. See Source data 1 for primary data and Fisher's exact test p-values and Figure 1—figure supplement 2 and Supplementary file 1 for analysis of additional alleles. n > 100 cells per condition. The HSN motor neuron controls vulval muscle contraction and its dysfunction leads to an egg laying defective (egl) phenotype. To identify the TF combination controlling HSN terminal differentiation, we selected among previously described egl mutants, those that both code for TFs and had reduced or no staining of 5HT in HSN. At least four genes matched this criteria: the POU domain TF unc-86, the Spalt-type Zn finger TF sem-4, the bHLH domain TF hlh-3 and the Insm-type Zn finger TF egl-46 (Basson and Horvitz, 1996; Doonan et al., 2008; Sze et al., 2002; Wu et al., 2001). In addition to previous reports, we found that the GATA factor egl-18, a regulator of HSN migration (Desai et al., 1988) and the ETS TF ast-1, a regulator of dopaminergic fate (Flames and Hobert, 2009), also exhibit an HSN 5HT staining phenotype not previously published. Thus, although additional TFs with subtler egl phenotypes or with pleiotropic lethal effects and no available hypomorphic alleles are likely to be required for correct HSN differentiation, we initially focused our study in this set of six TFs that we refer as the HSN TF combination. To confirm previous observations, we analyzed null alleles for each member of the HSN TF combination except for ast-1, where we used a hypomorphic allele as the null allele is lethal prior to HSN differentiation (Schmid et al., 2006). All TF mutants indeed displayed a defective egg laying phenotype and 5HT staining and 5HT pathway gene expression defects, further supporting their roles in HSN differentiation (Figure 1C,E and Source data 1). We observed similar 5HT staining and 5HT pathway gene expression defects by RNAi knock down and in the analysis of additional mutant alleles for each candidate TF confirming that the phenotype is due to mutations in each corresponding TF and not to background strain effects (Figure 1—figure supplement 2 and Supplementary file 1). Importantly, 5HT pathway gene expression defects were specific for the HSN serotonergic subclass, while ADF and NSM neurons were unaffected (Source data 1), the exception being unc-86(n846) which showed a previously reported NSM differentiation phenotype (Sze et al., 2002; Zhang et al., 2014). We next assessed whether the HSN TF combination is also required for the expression of non-5HT related genes by analyzing nine additional reporters. We observed expression defects in all mutant strains (Figure 1D,E and Source data 1). Although most terminal features were affected, the expression of some genes remained normal indicating that, in each single mutant, HSN neuron is present and shows broad but partial differentiation defects (Figure 1D,E). HSN neuron is born embryonically and remains in a quiescent undifferentiated state until fourth larval stage (L4), when it activates the expression of most effector genes, including the 5HT pathway genes. We did not observe precocious expression of any of the analyzed terminal features in any of the single mutant backgrounds, suggesting that the HSN TF combination acts mainly as activator of transcription. Most notably, the phenotypic profile of each mutant was slightly different from the others, which suggests that these TFs do not function in a cascade-like linear pathway (Figure 1E). The expression of the HSN TF combination has only been partially studied (Basson and Horvitz, 1996; Doonan et al., 2008; Finney et al., 1988; Wu et al., 2001). We used fosmid reporter strains (for unc-86, sem-4 and egl-18), endogenous locus tagging (for ast-1 and hlh-3, Figure 2—figure supplement 1) and a transcriptional reporter strain (for egl-46) to analyze their expression pattern in HSN throughout development. We find that all six TFs are expressed in the HSN at L4 coinciding with the onset of differentiation (Figure 2A). The HSN TF combination is also expressed in other neurons, including expression of UNC-86, EGL-18 and EGL-46 in the NSM serotonergic neuron, while none of them are expressed in the ADF serotonergic neuron. AST-1 acts as temporal switch for HSN maturation. (A) Micrographs showing expression of the HSN TF combination at L4 larval stage and adult animals. (B) Analysis of HSN TF expression across all developmental stages in the HSN neuron. n > 30 cells for each developmental point. Error bars are SEP values. See Figure 2—figure supplement 1 for more detailed hlh-3 developmental expression. (C) Heat-shock-induced expression of hlh-3 at L4 larval stage is able to rescue tph-1::gfp expression defects in the HSN neuron. n > 100 cells per condition. See Source data 1 for primary data and Fisher's exact test p-values. *: p-value <0.05. (D) Precocious L1 onset of expression of ast-1, hlh-3 or both using an early active HSN-specific promoter (also expressed in NSM, ADF and VC4/5 neurons). Precocious ast-1 advances tph-1::gfp expression, while hlh-3 alone or in combination with ast-1 delays tph-1::gfp expression and produces expression defects. YA: young adult. n > 30 cells per time point and condition. See Source data 1 for primary data and Fisher's exact test p-values. *: p-value <0.05. A deeper analysis of the developmental expression of each TF shows a very diverse array of expression dynamics (Figure 2B). Some HSN TFs are expressed embryonically (such as UNC-86, HLH-3 or EGL18). SEM-4 is widely expressed in the embryo in the area were HSN is located, although it is likely to be expressed at this early stage in HSN, we could not unequivocally identify it. In contrast, AST-1 and EGL-46 initiate their expression at different postnatal stages (Figure 2B). Interestingly, HLH-3 shows two waves of expression: it is present in the mother cell of HSN (around 280 min of embryonic development, see lineage in Figure 2—figure supplement 1) and its expression becomes fainter in postmitotic HSN and PHB neurons (data not shown). At first larval stage (L1), HLH-3 expression is undetectable in HSN and expression reappears at third larval stage (L3), preceding AST-1 onset of expression and HSN maturation and is quickly downregulated at the end of L4 [Figure 2B, Figure 2—figure supplement 1 and (Doonan et al., 2008)]. Thus, to further study the temporal requirements of HLH-3 activity in HSN differentiation, we induced HLH-3 expression at early L4 state in hlh-3 mutants. This late expression is sufficient to rescue tph-1 reporter expression defects indicating that embryonic HLH-3 expression is not required for correct HSN terminal differentiation (Figure 2C). Little is known about the temporal control of HSN differentiation. Heterochronic genes have been described to regulate the onset of HSN axon extension (Olsson-Carter and Slack, 2010), although the molecular mechanisms underlying this process are unknown. AST-1 and HLH-3 expression correlates with HSN maturation suggesting they might have a role in determining the onset of this process. We used an early active HSN promoter to induce ast-1 and hlh-3 expression precociously from first larval stage (L1). Our results show that AST-1 significantly advances tph-1 expression to L2-L3 larval stages (Figure 2D). On the contrary, early hlh-3 induced expression either alone or in combination with ast-1 leads to both a delay in onset and expression defects of tph-1 reporter gene (Figure 2D). Despite tph-1 expression defects, HSN was still present as we could identify it by differential interference contrast (DIC) (data not shown). These results suggest that AST-1 activity is an important determinant of HSN maturation onset. We also found that lin-41 heterochronic mutants show ast-1 expression defects in the HSN (data not shown) further supporting the role of AST-1 as a downstream effector controlling HSN maturation timing. Additionally, these experiments underscored the importance of the dynamic regulation of hlh-3 expression. HLH-3 is a proneural TF of the asc family, ortholog of mouse Ascl1 and Drosophila Scute (Figure 2—figure supplement 1). Proneural factors regulate both neural progenitor specification and neuronal differentiation and their functions are conserved through evolution from cnidarians to mammals (Guillemot and Hassan, 2017). Ascl1 is required for correct mouse serotonergic specification (Pattyn et al., 2004) and its activity is required to induce serotonergic fate from human fibroblasts (Vadodaria et al., 2016; Xu et al., 2016). HLH-3 shows several features common to ASCL1: (1) HLH-3 is transiently expressed in all neuronal progenitors and differentiating neuroblasts and it is required for correct differentiation of several neuronal types, including HSN (Doonan et al., 2008; Gruner et al., 2016; Krause et al., 1997; Luo and Horvitz, 2017; Murgan et al., 2015). (2) Both HLH-3 and ASCL1 are required to induce correct neurotransmitter identity (Pattyn et al., 2004; Sommer et al., 1995). (3) As will be explained in a later section, Ascl1 can rescue HSN differentiation defects of hlh-3 mutants, supporting its functional conservation. (4) As would be expected for a proneural gene, HLH-3 is also required for correct expression of panneuronal features in the HSN (Figure 1, rab-3 expression defects). (5) We find that HLH-3 expression needs to be tightly temporally regulated to correctly induce HSN fate. Temporal regulation of ASCL1 and SCUTE activities is also required for correct neuronal specification (Andersen et al., 2014; Imayoshi et al., 2013; Quan et al., 2016; Urbán et al., 2016). (6) HLH-3 regulates egl-46 expression (discussed in next section, Figure 3A) and similarly, Insm1 (ortholog of egl-46) is a direct target of Ascl1 (Castro et al., 2011). Taken together, our data suggests that HLH-3 acts as a proneural factor in HSN specification. Future experiments will determine if, similar to ASCL1 (Wapinski et al., 2013), HLH-3 acts as a pioneer factor to facilitate binding of other TFs and promote neural differentiation. UNC-86 is a master regulator of the HSN transcription factor combination. (A) Expression of the HSN TFs in different mutant backgrounds. All scorings were performed at adult stages except for HLH-3, where early L4 larvae were scored. Embryonic HLH-3 expression is unaffected in unc-86 mutants (data not shown). Graphs show the percentage of TF expression in mutant animals relative to wild type expression. n > 100 cells per condition, Fisher's exact test, *: p-value<0.05, See Source data 1 for raw data and exact p-values. (B) Summary of relationships among the HSN TF combination, black arrows mean strong effect (more than 50% loss of expression) and grey arrows depicts the rest of significant defects. (C) Loss-of-function (RNAi) experiments after HSN differentiation show that AST-1, UNC-86, SEM-4, EGL-46 and EGL-18 are required to maintain proper tph-1::yfp and cat-1::MDM2::gfp (unstable GFP) reporter expression. Worms were also scored prior to RNAi treatment to confirm correct HSN differentiation before starting the experiment. n > 100 cells per condition, Fisher's exact test, *: p-value <0.05. See Source data 1 for raw data and Figure 3—figure supplement 1 for maintenance analysis with temperature-sensitive alleles. We next examined whether these TFs could exhibit cross regulation by analyzing their expression in each of the six different TF mutant backgrounds. In most cases, expression of each TF was largely independent of the integrity of the rest of the HSN TFs (Figure 3A and Source data 1). However, UNC-86 is a notable exception as it is required for the expression of most factors (Figure 3A). Noteworthy, SEM-4, that is downstream UNC-86, is also required for AST-1 and partially for HLH-3 expression. Thus, UNC-86 effects could be, at least in part due to SEM-4 regulation. Finally, additional more modest effects are also observed between other TF pairs, such as the regulation of AST-1 and EGL-46 by HLH-3 (Figure 3A and summarized in Figure 3B). Since TFs required for neuronal terminal differentiation are often also required to maintain the correct differentiated state (Deneris and Hobert, 2014), we explored whether this was also the case for the HSN TFs. We find that UNC-86, SEM-4, AST-1, EGL-46 and EGL-18 expression is maintained in HSN after differentiation while HLH-3 expression is not observed after larval L4 stage (Figure 2A and B). RNAi experiments to knock down the expression of the adult expressed TFs after HSN maturation produce defects in the maintenance of tph-1 and cat-1 expression (Figure 3C). Additionally, the use of temperature-sensitive alleles for ast-1, unc-86 and sem-4 leads to similar maintenance defects (Figure 3—figure supplement 1). Our results revealed that these five TFs are continuously required to maintain the correct HSN differentiated state. 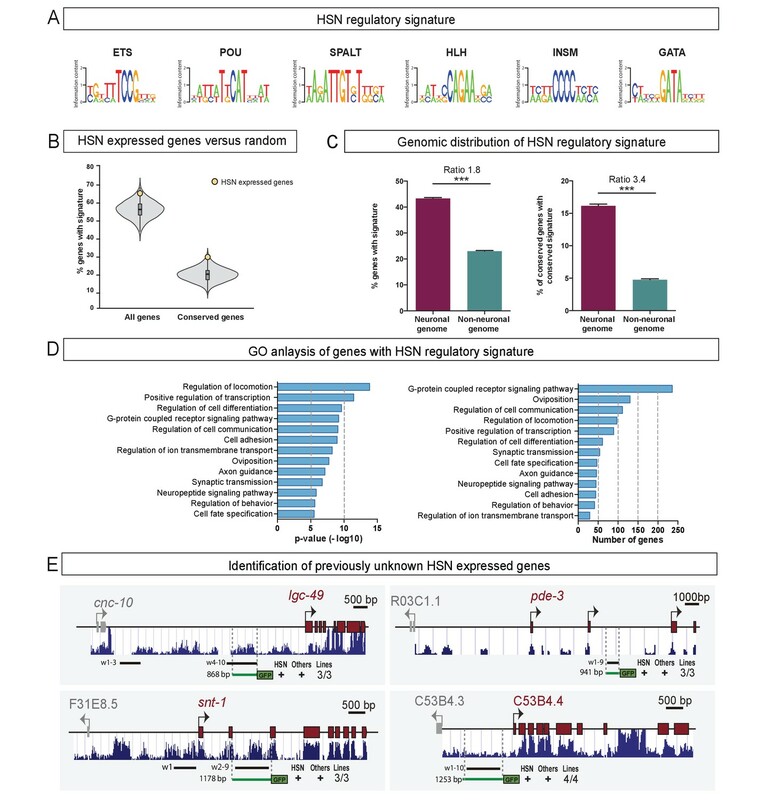 We next performed a comprehensive, in vivo analysis of the cis-regulatory modules (CRMs) for 5HT pathway genes to analyze how the HSN TFs regulate HSN terminal differentiation. First, we dissected the regulatory regions of the 5HT pathway genes by in vivo reporter analysis and isolated the minimal CRMs able to direct expression in each serotonergic neuron subclass (Figure 4 and Figure 4—figure supplement 1). We found that for each gene, different CRMs were active in specific subclasses of serotonergic neurons (HSN, NSM or ADF). This suggests that expression of the same 5HT pathway gene is independently regulated in each of the three serotonergic neuron subclasses. These results, together with previous reports of different TF mutants affecting specific subclasses of serotonergic neurons (Desai et al., 1988, Olsson-Carter and Slack, 2010, Zhang et al., 2014, Zheng et al., 2005) support the presence of subclass-specific serotonergic differentiation programs. Of note, 5HT pathway gene CRMs in some cases partially overlap (Figure 4). This overlap might be due to the presence of shared TFBS among serotonergic neuron subclasses and indeed, UNC-86 regulates both NSM and HSN differentiation (Sze et al., 2002). We found that disruption of POU TFBS in tph-1 and bas-1 HSN CRMs but not in cat-1 CRM (discussed in the following section) affects both HSN and NSM expression. TFs are pleiotropic and it is known that the same TF can act with different combinations of TFs in different neuronal types to control neuron-type-specific genetic programs (Hobert, 2016). 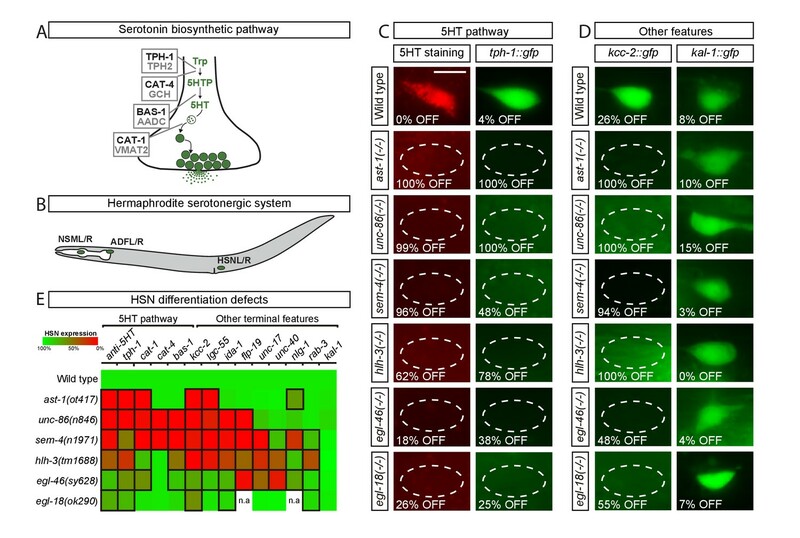 Distinct cis-regulatory modules control serotonin pathway gene expression in different subclasses of serotonergic neurons (A–D) cis-regulatory analysis of the 5HT pathway genes. White boxes underneath each gene summarize the smallest CRM that drive expression in each serotonergic neuron subclass. Thick black lines symbolize the genomic region placed upstream of GFP (green box) and dashed lines are used to place each construct in the context of the locus. OA: other aminergic cells (RIC, RIM, AIM, RIH, CEPs, ADE, PDE, VC4/5) that also share the expression of some 5HT pathway genes. Numbers in brackets represent the coordinates of each construct referred to the ATG. +: >60% GFP positive cells; +/−: 20–60% GFP cells; −: <20% GFP cells. x/y represents the number of lines with the expression pattern (x) from the total lines analyzed (y). n > 60 cells per line. See Figure 4—figure supplement 1 for raw values. 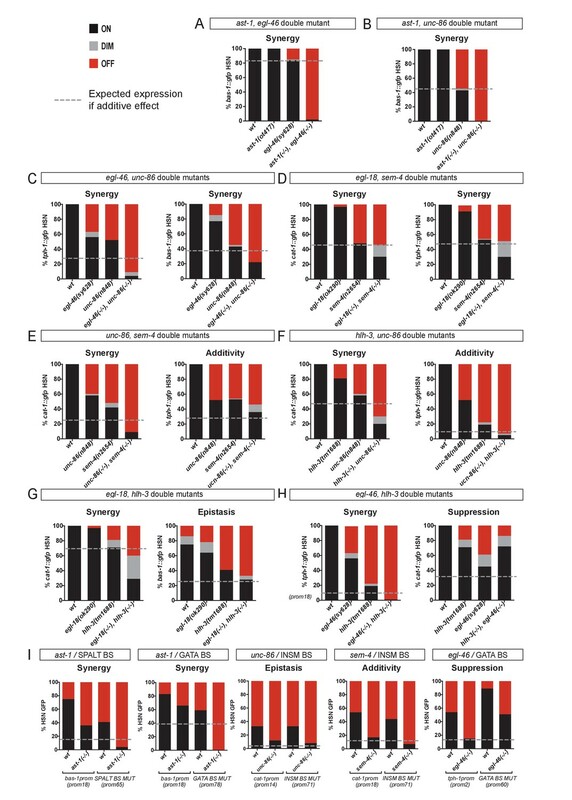 The observed serotonergic subclass independent regulation of 5HT pathway genes is in sharp contrast with our previous study of the dopaminergic regulatory logic in which all four subclasses of dopaminergic neurons are regulated by the same combination of TFs and through unique CRMs (Doitsidou et al., 2013; Flames and Hobert, 2009). Dopaminergic neuron subclasses are functionally similar (mechanosensory neurons), which may explain why they can share a unique TF combination to select a similar transcriptome. Conversely, the functional and molecular diversity of serotonergic neuron subclasses would require independent TF programs to select diverse terminal transcriptomes. Next, to assess whether the action of the HSN TF combination was direct on the serotonergic regulatory regions, we focused our analyses on the HSN minimal CRMs from the three 5HT pathway genes that showed the strongest phenotypes in our previous mutant analysis: tph-1 (TPH), cat-1 (VMAT) and bas-1 (AADC). We performed site-directed mutagenesis on predicted TFBS in these CRMs and analyzed in vivo the effect of the mutations. Our analysis, explained in detail below, revealed that all members of the HSN TF combination act directly upon 5HT pathway gene CRMs. Each CRM has a different disposition of TFBS arrangements supporting the flexible function of the HSN TFs. Additionally, we found examples of redundancy between TFBS that provide robustness of expression to the system and whose functionality can only be revealed in the context of smaller CRMs or mutant backgrounds. Notably, redundancy is specific to the CRM architecture as two TFs can act redundantly in one CRM but not in others. Finally, we also found that short HSN CRMs that lack TFBS for some HSN TF members can drive partially penetrant HSN expression, while longer CRMs with functional binding sites for additional members of HSN TFs drive more robust expression. This direct but flexible action of a combination of TFs to directly regulate cell type specification has been previously termed ‘TF collective’ mode of regulation (Junion et al., 2012; Spitz and Furlong, 2012), accordingly, we termed this set of TFs the ‘HSN TF collective’. The HSN minimal CRM for tph-1 (TPH) (tph-1prom2, Figure 4A) contained predicted binding sites for all six HSN TF members (Figure 5A). In vivo mutation reporter analyses revealed that all except the SPALT- and GATA-binding sites were required for proper tph-1 expression in HSN (Figure 5A and Figure 5—figure supplement 1). SEM-4 (SPALT) is required for ast-1 expression thus its effect on tph-1 expression could be indirect. Paradoxically, egl-18 (GATA) mutants showed defects in tph-1prom2 expression, similar to what was observed for the full-length reporter (Figure 5B). Taking into account that EGL-18 does not regulate the expression of any member of the HSN TF collective, it may act upstream of another unidentified TF to regulate tph-1prom2 expression. Alternatively, EGL-18 may be recruited to the tph-1 promoter even in the absence of functional GATA -binding sites, perhaps through interactions with other members of the HSN TF collective. Similar binding site-independent recruitment of TFs, when combinatorially binding in a TF collective, has been reported for other combinations of TFs (Junion et al., 2012; Uhl et al., 2016). HSN transcription factor combination acts directly on target genes. (A) tph-1 minimal HSN CRM (tph-1prom2) mutational analysis. Black crosses represent point mutations to disrupt the corresponding TFBS. +: > 60% of mean wild type construct values; +/−: expression values 60–20% lower than mean wild type expression values; −: values are less than 20% of mean wild type values. n > 60 cells per line. x/y represents the number of lines with the expression pattern (x) from the total lines analyzed (y). See Figure 5—figure supplement 1 for raw values and nature of the mutations and Figure 5—figure supplement 2 for in vitro binding. (B) tph-1prom2::gfp expression is partially affected in egl-18(ok290) mutants. In red, significant defects relative to wild type. n > 100 cells for each genotype. (C) cat-1 minimal HSN CRM (cat-1prom14) mutational analysis. (D) cat-1prom14::gfp expression is unaffected in egl-46 mutants, which coincides with the lack of phenotype when INSM binding sites are mutated in this construct. cat-1prom14::gfp contains functional GATA sites and, as expected, its expression is affected in egl-18 mutants. Expression of a longer reporter (cat-1prom1::gfp) is independent of egl-18 revealing compensatory effects in the context of big regulatory sequences. (E) bas-1 minimal HSN CRM (bas-1prom18) mutational analysis. (F) A longer bas-1 construct (bas-1prom13) is more robustly expressed in HSN (90% expression compared to mean 48% expression of bas-1prom18 reporter lines). This construct contains functional INSM binding sites. (G) bas-1prom18::gfp expression is affected in ast-1(ot417) and egl-18(ok290) mutants. Expression of a longer reporter (bas-1::prom1) is independent of ast-1 and egl-18 revealing compensatory effects in the context of big regulatory sequences. (H) GATA-binding site point mutation does not significantly affect bas-1::gfp expression in the wild type background (no significant difference between mean expression of three lines of bas1prom1 and three lines of bas1prom18). However, it synergizes with ast-1 mutant background leading to a complete loss of GFP expression. These results unravel a direct role for GATA sites in bas-1 gene expression and synergy between egl-18 and ast-1. The HSN minimal CRM for cat-1 (VMAT) (cat-1prom14, Figure 4B) also contained predicted binding sites for the HSN TF collective (Figure 5C). Point mutation analyses revealed functionality of all but INSM-binding sites (Figure 5C and Figure 5—figure supplement 1). In agreement with this observation, we found that cat-1prom14 expression does not require EGL-46 (INSM) factor (Figure 5D). However, the penetrance of HSN expression for the minimal cat-1prom14 was much lower than for the full-length reporter (55% versus 100% expression, respectively, Figure 5D). This indicates that additional TFBS outside of the minimal CRM are required to promote robust HSN expression. Indeed, full-length reporter (cat-1prom1) expression was affected in egl-46 mutants (Figure 5D). These results suggest that, although partial expression from cat-1 can be achieved without EGL-46, this TF is required for robust expression in the context of the full cat-1 promoter. The requirement for GATA sites in the cat-1 minimal CRM contrasted with the lack of an expression defect of a full-length cat-1 reporter in egl-18 (GATA) mutants (Figure 5D). However, when we analyzed the minimal cat-1 CRM (cat-1prom14) in egl-18 mutants we found that its activity was affected in this mutant background (Figure 5D). Thus, EGL-18 directly regulates cat-1 expression but its loss can be compensated in the context of a large regulatory region by other unknown factors. We confirmed EGL-18 direct binding to the cat-1 promoter in vitro using electrophoretic mobility shift assays (EMSA) (Figure 5—figure supplement 2). The HSN minimal CRM for bas-1 (AADC) (bas-1prom18, Figure 4C) contained predicted binding sites for four TFs from the HSN TF collective: ETS, POU, GATA and SPALT TFs, but lacked any predicted INSM- or HLH-binding sites. 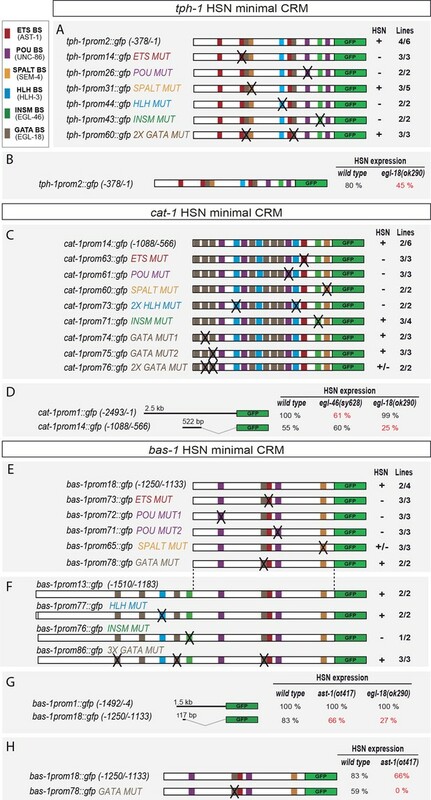 Reporter analyses of the minimal CRM revealed that ETS-, POU- and SPALT- but not GATA-binding sites were required for expression in HSN (Figure 5E and Figure 5—figure supplement 1). Similar to cat-1, a bas-1 functional binding site for several TFs was detectable only in the context of the minimal small CRMs while there was no defect in expression of the full-length reporter in the corresponding TF mutant backgrounds. For example, we found functional ETS- (ast-1) binding sites in bas-1prom18 while expression of the full-length bas-1 reporter was unaffected in ast-1 (ot417) (Figure 5G). 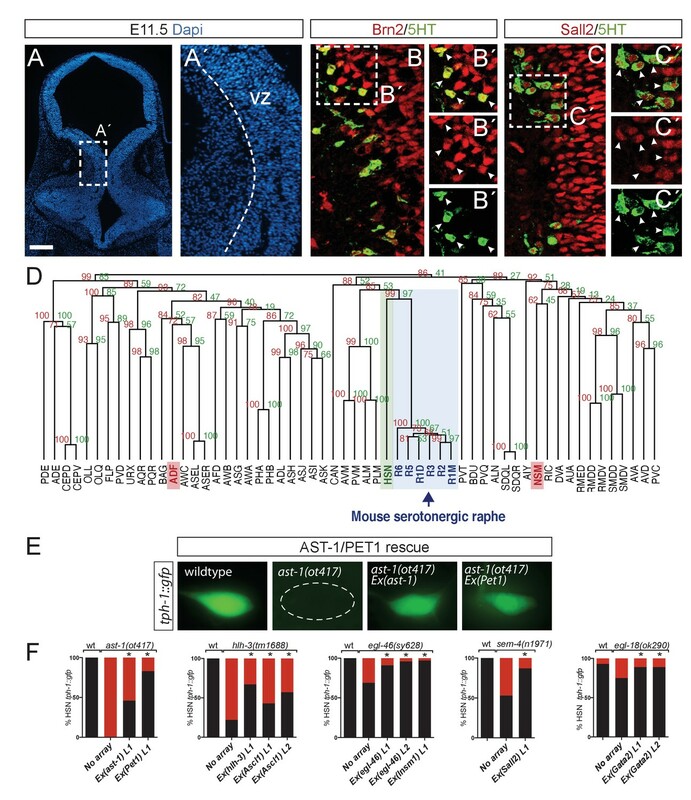 As ast-1 (ot417) is a hypomorphic allele, we confirmed that ast-1 is not required for bas-1 full-length reporter expression by mosaic analyses with a rescuing array in a null ast-1 allele (hd92) (87 out of 87 ast-1 null HSN neurons expressed bas-1). We analyzed minimal CRM bas-1prom18 activity in ast-1(ot417) mutants and found a small but significant reduction in the percentage of GFP-positive HSNs (Figure 5G). We also confirmed AST-1 binding to the bas-1 promoter in vitro using EMSA (Figure 5—figure supplement 2). Altogether, these results suggest that AST-1 can bind and activate transcription from the bas-1 minimal CRM as can EGL-18 from cat-1 minimal CRM. In both cases, however, other factors can compensate for their loss by activating transcription from regulatory sequences outside the minimal CRMs. 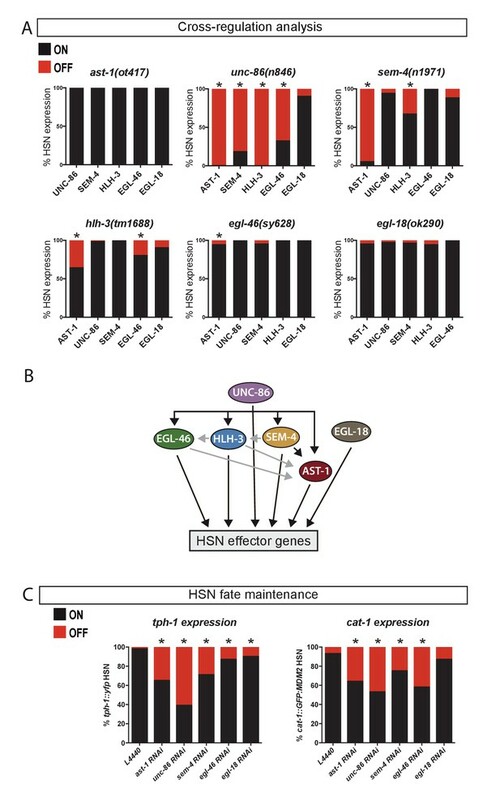 This genetic redundancy for some members of the HSN TF collective at specific 5HT pathway genes possibly acts as a mechanism to ensure that differentiation is robust. Although HLH-3 (bHLH) and EGL-46 (INSM) were required for full-length bas-1 expression (Figure 1E), no functional HLH- or INSM-binding sites were found in the minimal bas-1 CRM (bas-1prom18) (Figure 5E). Similar to the minimal cat-1 CRM (cat-1prom14), GFP expression of bas-1prom18 was partially penetrant (ranging from 38% to 83% depending on the transgenic line, Figure 5—figure supplement 1), while a longer construct (bas-1prom13) was more robustly expressed (90% expression in all lines, Figure 5—figure supplement 1). bas-1prom13 contains bHLH- and INSM-binding sites and INMS-binding site mutation, but not bHLH mutation, leads to expression defects which suggest a direct role for EGL-46 in robust bas-1 expression (Figure 5F). We did not find functional GATA-binding sites in bas-1 CRMs, and egl-18 (GATA) mutants did not show bas-1 expression defects either. This would suggest that GATA factors are dispensable for the regulation of this gene. However, as we had already observed genetic redundancy in other CRMs, we considered that this could also be the case for bas-1 regulation. First, we analyzed bas-1 minimal CRM expression (bas-1prom18) in egl-18(ok290) mutants and found that EGL-18 was required for its normal expression (Figure 5G). Next, to determine whether the role for GATA factors in bas-1 expression was direct, we analyzed the expression of a bas-1 minimal CRM carrying GATA-binding site mutations (bas-1prom78) in the ast-1(ot417) genetic background. Interestingly, while GATA-binding site mutations had no significant effects in wild type worms, we found a complete loss of expression of this construct in ast-1(ot417) mutants (Figure 5H). These results revealed both a direct role for GATA factors in bas-1 expression and redundancy/compensatory effects between egl-18 and ast-1. Interestingly, these two factors do not act redundantly in other CRMs such as tph-1. Of note, despite the fact that HLH-3 expression is not maintained during adulthood (Figure 2B) we find functional bHLH-binding sites both in tph-1 and in cat-1 CRMs. These results suggest that HLH-3 is directly required to initiate expression of some HSN effector genes. Similar direct action on effector genes has been described for mouse ortholog ASCL1 in the regulation of neuronal differentiation (Raposo et al., 2015). Our cis-regulatory analysis revealed compensatory effects among the HSN TF collective, thus, to increase our understanding of the TF collective action, we performed double mutant analysis. We analyzed tph-1, cat-1 and bas-1 reporters because their HSN CRMs contain functionally verified binding sites for all six factors (Figure 5). unc-86 and sem-4 null mutants show complete loss of expression of tph-1, cat-1 and bas-1, thus we used hypomorphic alleles with partial phenotypes for double mutant analysis. HSN TF collective shows enhancer-context dependent synergistic relationships. (A–H) Double mutant analysis of different pairs of the HSN TF collective. Expression level expected from additive effects (calculated as the product of single mutant expression values) is marked with a dotted line. Double mutant phenotypes statistically different from additive effect (Pearson’s chi-squared test) are classified as synergistic (if phenotype is stronger than additive), epistatic (if phenotype is similar to one of the single mutants) or suppression (if phenotype is milder than the expected for additivity or the single mutants). The majority of the double mutant combinations show synergistic effects. n > 100 cells each genotype. See Figure 6—figure supplement 1 and Figure 6—source data 1 for raw values, statistics and additional double mutant combinations. (I) Cis-trans mutant analysis. TFBS mutations are combined with single mutants of the HSN TF collective. n > 100 cells each genotype. See Figure 6—source data 1 raw values and statistics. The HSN TF collective has pleiotropic functions. To try to avoid pleiotropic effects, we took advantage of our cis-regulatory data to perform combinations of TFBS mutations. To check for TFBS interactions, our analysis was limited to those sites which mutations produced only partial defects (Figure 5). We tested three out of the four possible combined TFBS mutations; however, none of these constructs showed synergistic effects (Figure 6—figure supplement 1). Interestingly, double cis SPALT- and GATA- BS mutations do not show synergy in the context of the minimal tph-1 CRM despite the synergistic effect observed for sem-4, egl-18 double mutants in the regulation of tph-1 full length reporter. As these two factors do not regulate each other's expression (Figure 3B), it is possible that TFBS mutations are more easily compensated than mutations in the corresponding trans-activating factors. As we were limited by the lack of additional BS mutations with partial effects, we next combined cis mutations of the TFBS with trans effects of TF single mutants. 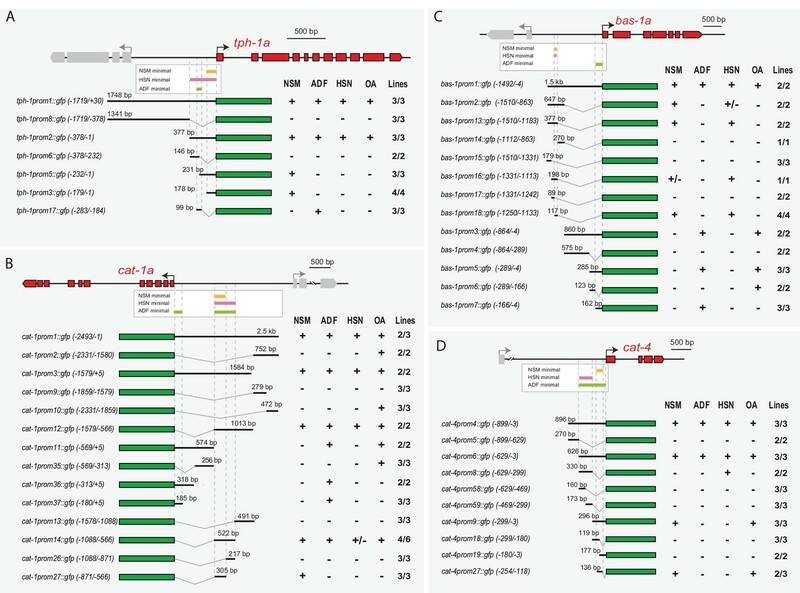 Combined cis/trans mutant analysis revealed synergistic relationships among two additional pairs of the HSN TF collective (Figure 6I). Altogether, we found synergistic relationships among 9 out of the 15 possible HSN TF collective pair combinations (Figure 6—figure supplement 1 and Figure 6—source data 1). In addition to synergism, additivity and epistasis, we found several examples of genetic suppression both in the double mutant and the cis/trans mutant analysis (Figure 6I and Figure 6—figure supplement 1). Similar to the other genetic interactions, suppression is also TF pair and enhancer context specific. Altogether, the emerging picture is that of a joint action of the HSN TF collective upon their direct target genes. This regulation is flexible and often partially redundant showing synergistic relationships among different members of the HSN TF collective. Importantly, specific relationships and dependencies are determined by the CRM context and by the specific TF pairs tested. Our results suggest that the HSN TF collective is required for broad activation of HSN effector genes (and not only for 5HT pathway gene expression) (Figure 1) and it acts directly on the regulatory regions of their target genes (Figure 5). Since the members of the HSN TF collective belong to six different TF families that recognize very different binding sites (Figure 7A), we wondered whether the clustering of binding sites for the HSN TF collective in regulatory regions of HSN effector genes might confer sufficient specificity to impose a defining regulatory signature. The HSN regulatory signature can be used to de novo identify HSN expressed genes. (A) Position weight matrix logos of the HSN TF collective calculated from the functional binding sites in Figure 5. (B) HSN regulatory signature is more prevalent in the set of 96 known HSN expressed genes (yellow dot) compared to the distribution in 10,000 sets of random comparable genes (grey violin plot) (p<0.05). Considering phylogenetic conservation of HSN regulatory signature increases the enrichment of the HSN regulatory signature in the HSN expressed genes (p<0.01). See also Figure 7—figure supplement 1 for additional data. (C) HSN regulatory signature is enriched in neuronal genes compared to the non-neuronal genome. Inclusion of the conservation criteria in the HSN regulatory signature analysis strongly increases the difference between neuronal and non-neuronal genome. Pearson’s chi-squared test. ***p-value<0.0001. See also Figure 7—figure supplement 2 for additional data. (D) Gene ontology analysis of genes with HSN regulatory signature. p-values and number of genes corresponding to the biological processes enriched in genes with HSN regulatory signature. (E) Four representative examples of de novo identified HSN active enhancers. Black lines represent the coordinates covered by bioinformatically predicted HSN regulatory signature windows (indicated by ‘w’ and a number). Green lines mark the region used in our analysis. Dark blue bar profiles represent sequence conservation in C. briggsae, C. brenneri, C. remanei and C. japonica. n > 60 cells per line. See Figure 7—source data 1 for a list of all reporters and raw scoring data. Expression level of most of these reporters is regulated by unc-86 (Figure 7—figure supplement 3). There are 96 genes known to be expressed in the HSN neuron (Supplementary file 2) (Hobert et al., 2016), excluding pan-neuronal features which are regulated in a very redundant manner (Stefanakis et al., 2015). We analyzed upstream and intronic sequences of HSN expressed genes in search of DNA windows (up to 700 bp length) containing at least one position weight matrix match for all six members of the HSN TF collective (termed the ‘HSN regulatory signature’) (Figure 7A). We found that known HSN expressed genes contained large upstream and intronic sequences, thus, for comparison purposes, we built ten thousand sets of 96 random genes with similar upstream and intronic length distribution. A significantly higher percentage of HSN expressed genes contain the HSN regulatory signature compared to the random sets of genes (p<0.05) (Figure 7B, Figure 7—source data 1). Studies in Drosophila and vertebrates have shown that functional enhancers that are bound by combinations of TFs show higher interspecific conservation compared to enhancers bound by single TFs (Ballester et al., 2014; Khoueiry et al., 2017; Stefflova et al., 2013). Thus, we performed a similar motif search in C. brenneri, C. remanei, C. briggsae and C. japonica genomes and calculated, for each C. elegans gene, the proportion of its orthologs that had, in its upstream or intronic sequence, at least one 700 bp window with binding sites for all the six TFs. We considered the HSN regulatory signature as phylogenetically conserved when orthologous genes in all species displayed the signature within their upstream or intronic regions. We found that the inclusion of the conservation criteria in this analysis slightly increased the difference between HSN and the random sets of genes (p<0.01) (Figure 7B). The higher prevalence of conserved signature in HSN expressed genes supports the idea that the HSN TF collective broadly selects the HSN transcriptome. We tested HSN regulatory signature windows from four of the known HSN expressed genes by in vivo reporter assays and confirmed that they correspond to active HSN enhancers (three out of four tested contructs show HSN expression, Figure 7—figure supplement 1 and Figure 7—source data 2). Of note, C. elegans functional HSN regulatory signature windows do not show a high level of sequence conservation (Figure 7—figure supplement 1), which is in agreement with rapid evolution of regulatory sequences (Villar et al., 2015). Next, we examined the distribution of the HSN regulatory signature windows across the entire C. elegans genome. Remarkably, we found that it was preferentially found in the putative regulatory sequences of genes known to be expressed in neurons or that have a neuronal function compared to the rest of the genome, as would be expected for genes controlled by the HSN TF collective (Figure 7C). Filtering of conserved regulatory signatures further increased the difference between ‘neuronal’ and ‘non-neuronal’ genomes, which adds support to its functionality (Figure 7C). Gene ontology analysis of all genes in the C. elegans genome with HSN regulatory signature revealed enrichment of processes controlling transcription, axon guidance, synaptic transmission and oviposition, all characteristic of HSN differentiation and function (Figure 7D). Our experimental data (Figure 5), in agreement to the TF collective model (Spitz and Furlong, 2012), shows that the presence of TFBS for all TF collective members is not required in specific enhancer contexts. Thus, we aimed to analyze if HSN regulatory windows lacking TF-binding sites for one or two TF classes show also an enriched distribution in HSN expressed genes and in the neuronal genome. We find that, in contrast to the six-motif HSN regulatory signature, windows containing only five or four types of HSN TF motifs are not preferentially found in HSN expressed genes compared to the 10.000 random sets of genes with or without filtering for conservation (p>0.05 in all conditions) (Figure 7—figure supplement 2). Additionally, genomic distribution of the HSN regulatory signature is less enriched in neuronal genes compared to non-neuronal genes when including windows lacking one or two HSN TF collective motifs (Figure 7—figure supplement 2). Moreover, while only 25% of the genes (4,968) contain at least one assigned six-motif regulatory window, regulatory windows with five or more motifs are found in 52% of the genes (10,415) and 72% of the genes (14,325) contain windows with four or more motifs. Finally, GO comparative analysis shows that genes with assigned 6-motif HSN regulatory windows show the highest enrichment in terms related to HSN function and that the additional GO terms obtained when including windows lacking either one or two HSN TF motifs are not related to neuronal functions (Figure 7—figure supplement 2). Altogether, our data shows that the most prevalent mark of HSN expressed genes is the regulatory signature with all six TFBS. Even if some HSN enhancers can still be functional with a partial complement of HSN TF collective binding sites, at the genomic level, including enhancers with missing TFBS abolishes cell type specificity. Next, we aimed to identify new genes expressed in HSN based solely on the presence of the HSN regulatory signature. To this end, we randomly selected 35 neuronal genes with a conserved HSN regulatory signature and generated transgenic reporter lines. We found that 13 out of the 35 constructs (37%) showed GFP expression in HSN (Figure 7E and Figure 7—source data 2), while none of 10 randomly picked similar-sized intergenic regions of neuronal genes lacking the HSN regulatory signature led to reporter expression in HSN (Figure 7—source data 2). Importantly, all reporter constructs, including the negative controls, did drive GFP expression in a variable set of additional neurons, which might be due to the compact nature of the C. elegans genome. Finally, to analyze if the activity of the identified HSN regulatory windows was under the control of the HSN TF collective we crossed them into the unc-86(n846) mutant. The expression of 12 out of 15 reporter constructs (80%) was significantly reduced in unc-86 mutants (Figure 7—figure supplement 3). Of note, onset of expression of the HSN regulatory window reporters can be used to predict the effect of unc-86 mutation: while all reporters with L4 onset of expression are strongly dependent on unc-86, HSN regulatory windows that initiate expression at earlier stages show more modest dependency on unc-86 function (Figure 7—figure supplement 3). Our results reveal that the presence of a conserved HSN regulatory signature can be successfully used to de novo identify HSN expressed genes. However, our high level of false positives (63%) indicates that the signature itself is not sufficient to induce HSN expression. Additional TFs might be part of the HSN TF collective and thus active HSN regulatory signature windows would contain additional TFBS. Repressive elements or chromatin accessibility could also block HSN expression of non-functional HSN regulatory signature windows, indeed members of the SWI/SNF chromatin remodeling complex are required for correct HSN terminal differentiation (Weinberg et al., 2013). It is also possible that specific syntactic rules (TFBS order, distance and disposition) discriminate functional from non-functional HSN regulatory signature windows. Future studies will help identify additional players and rules for HSN terminal differentiation. Mouse orthologs for four out of the six TFs of the HSN TF collective are involved in mammalian serotonergic specification: ASCL1 (bHLH TF ortholog of HLH-3) (Pattyn et al., 2004), GATA2/3 (GATA TF ortholog of EGL-18) (Haugas et al., 2016), INSM1 (Zn Finger Insm TF ortholog of EGL-46) (Jacob et al., 2009) and PET1 (ETS TF ortholog of AST-1) (Hendricks et al., 2003). Additionally, BRN2 (also known as POU3F2, a POU TF from the same family that UNC-86) has been associated with serotonergic specification, although its expression in serotonergic neurons has not been studied (Nasu et al., 2014). We analyzed BRN2 expression in serotonergic differentiating neurons and found it expressed in serotonergic progenitors and serotonergic newborn neurons at embryonic stage E11.5, when serotonergic neurons are differentiating (Figure 8A and B). Finally, SALL2 is the closest mouse ortholog for C. elegans SEM-4, but there is no known role for any SALL TFs in serotonergic specification. We found that SALL2 is also expressed in serotonergic progenitors and serotonergic newborn neurons at embryonic stage E11.5 (Figure 8A and C). Deep homology between HSN and mouse serotonergic raphe neurons. (A) Micrograph of mouse embryonic day 11.5 hindbrain coronal section with DAPI staining. Square box indicates the region in A', B and C panels. VZ: ventricular zone, where progenitors are located. Scale bar: 100 μm. (B) BRN2 and 5HT co-staining. BRN2 is expressed in progenitors and differentiating serotonergic neurons. Arrowheads indicate double labeled cells. Scale bar: 20 μm. (C) SALL2 and 5HT co-staining. SALL2 is expressed in progenitors and differentiating serotonergic neurons. Arrowheads indicate double labeled cells. Scale bar: 20 μm. (D) Hierarchical clustering analysis of C. elegans neuron expression profiles with mouse serotonergic raphe neurons shows that HSN (in green) is closest to mouse serotonergic neurons (in blue). Other C. elegans serotonergic neuron classes (ADF and NSM in red) do not show a close relationship with mouse serotonergic raphe. R1D: Dorsal serotonergic neurons from rhombomere r1; R1M: Medial serotonergic neurons from rhombomere r1; R2: serotonergic neurons from rhombomere r2; R3: serotonergic neurons from rhombomere r3; R5: serotonergic neurons from rhombomere r5; R6: serotonergic neurons from rhombomere r6. See also Figure 8—figure supplement 1. (E) Micrographs showing tph-1::gfp expression in wild type animals, ast-1(ot417) mutants, and ast-1(ot417) mutants rescued with ast-1 cDNA or mouse Pet1 cDNA expressed under the bas-1 promoter whose expression in not affected in this mutant background. (F) Quantification of tph-1::gfp HSN expression rescue of different HSN TF collective mutants with worm and mouse ortholog cDNAs. n > 100 cells per condition. Fisher's exact test, *: p-value<0.05. ‘L’ indicates the transgenic line number. In evolutionary biology, the term deep homology refers to the relationship between two structures that share the genetic mechanisms governing their differentiation (Shubin et al., 1997). As C. elegans HSN and mouse raphe serotonergic neurons share many of the TFs required for their differentiation, we hypothesized that they might be homologous structures. If this were the case, then HSN neurons and mouse serotonergic raphe should not merely share the expression of 5HT pathway genes, which are also present in the other C. elegans serotonergic neuron classes, but also be more broadly similar in molecular terms. To address this, we used available gene expression data from the WormBase to generate partial expression profiles for the 118 neuronal classes of the C. elegans hermaphrodite. This partial expression profile can be successfully used to reproduce the anatomical classification of C. elegans neuron subtypes (Hobert et al., 2016). We assigned mouse orthologs to C. elegans neuronal genes and merged the resulting table with another one featuring the available mouse raphe serotonergic neuron transcriptome (Okaty et al., 2015). Hierarchical clustering of this data set shows that HSN is, molecularly, the closest neuron to the mouse raphe neurons (Figure 8D). Importantly, hierarchical clustering generated from mouse orthologs of C. elegans genes resembles the neuron class clustering generated directly from C. elegans genes (Hobert et al., 2016). HSN and mouse raphe close relationship is not merely due to 5HT pathway genes expression because NSM and ADF serotonergic neurons are molecularly more distant to the mouse raphe serotonergic neurons than HSN (Figure 8D and Source Data 5). Moreover, HSN remained the most similar neuron to mouse serotonergic raphe neurons even after removing the 5HT pathway genes from the HSN expression profile (Figure 8—figure supplement 1). Shared orthologous genes between HSN and mouse raphe serotonergic neurons belong to different functional categories including axon guidance and migration, neurotransmission, or transcriptional regulation (Table 1). Importantly, HSN proximity to mouse serotonergic neurons was not maintained with other mouse neuronal populations (Figure 8—figure supplement 1). Finally, to test if there is deep homology between HSN and mouse raphe serotonergic neurons, we tested if mouse orthologs of the HSN TF collective can functionally substitute for their worm counterparts. We performed cell-specific rescue experiments of C. elegans mutants and found that mouse Pet1, Ascl1, Insm1, Gata2 and Sall2 could respectively substitute ast-1, hlh-3, egl-46, egl-18 and sem-4, which suggest that this regulatory program could be phylogenetically conserved (Figure 8E and F). Of note, our rescue experiments, both with C. elegans or mouse genes, restore tph-1 expression but do not rescue egg-laying defects. The HSN TF collective has pleiotropic actions in other tissues that also contribute to the egg laying phenotype (Basson and Horvitz, 1996; Doonan et al., 2008; Eisenmann and Kim, 2000; Koh et al., 2002) what could explain the persistence of egg-laying defects in the HSN specific rescue experiments. In sum, these results revealed an unexpected level of regulatory and molecular proximity between C. elegans HSN and mouse serotonergic raphe neurons suggesting that deep homology might exist between these two neuronal types. Our extensive analysis of the HSN regulatory logic has revealed insights into how the complement of cell-type-specific enhancers is selected. We found that numerous TFs (here we identify six but likely additional TFs are required) act in conjunction to directly activate the HSN regulatory landscape. HSN TF collective acts through the HSN regulatory signature, which is found preferentially associated to genes of the neuronal genome that are related to HSN function. Neuronal terminal differentiation programs have been best characterized in C. elegans. So far, relatively simple TF combinations, composed of two or three members, were shown to be required, and in some contexts sufficient, to select specific neuronal types. These TFs have been termed Terminal Selectors (Doitsidou et al., 2013; Serrano-Saiz et al., 2013; Van Buskirk and Sternberg, 2010; Zhang et al., 2002). In some cases, additional TFs act together with Terminal Selectors to partially modulate the transcriptomes of specific neuronal subclasses (Kerk et al., 2017; Kratsios et al., 2017). Accordingly, it has been suggested that, in C. elegans, a rather simple organization of CRMs control the expression of neuronal terminal features (Holmberg and Perlmann, 2012). Our results, however, demonstrate a more complex scenario in the regulation of the HSN transcriptome. We have identified six TFs required for HSN terminal differentiation acting directly upon the regulatory regions of HSN expressed genes. Nonetheless, additional unidentified factors are likely to compose the HSN TF collective. We found that the HSN TF collective includes a proneural TF (hlh-3) that is required to initiate HSN differentiation but whose expression, like all proneural factors (Guillemot and Hassan, 2017), is not maintained in the mature neuron. Future experiments should determine if, as has been proven for its mouse ortholog Ascl1 (Wapinski et al., 2013), hlh-3 acts as a pioneer factor for HSN terminal differentiation. In light of our findings, nematode neuronal terminal differentiation programs are not necessarily simpler than those found in vertebrates, as previously proposed (Holmberg and Perlmann, 2012). Considering the technical advantages of C. elegans as a simple model system, our work is an example on how its study may help to identify rules of terminal differentiation in eumetazoa. The combination of our extensive cis-regulatory analysis and the double mutant characterization allowed us to describe the flexible action of the HSN TF collective that can activate enhancers with very different dispositions of TFBS. This flexibility is also made evident by the specific synergistic relationships in the regulation of some enhancers and not others. We propose that these redundant actions, globally considered, confer robustness of expression to the system. Co-binding of specific combinations of TFs to the same genomic region, assessed by ChIP-seq, has been successfully used to identify, de novo, cell-type-specific enhancers in Drosophila embryos (Busser et al., 2015; Junion et al., 2012; Zinzen et al., 2009). However, this approach fails to address why specific genomic regions work as enhancers. Recently, massively parallel reporter assays (MPRA) have been used to identify generic rules of enhancer function. The analysis of synthetic enhancers revealed that highest levels of expression are achieved with clusters of binding sites for different TFs (Smith et al., 2013). Another MPRA study has analyzed enhancer activity of regions bound by the adipocyte terminal selector PPARγ and has determined that the best predictor for enhancer functionality is the presence of nearby TFBS for more than 30 different TFs expressed in adipocytes (Grossman et al., 2017). In accordance to this complex scenario of combinatorial action of multiple TFs in the global selection of cell type regulatory landscapes, we found that clusters of bioinformatically predicted TFBS for the HSN TF collective can be used for the de novo identification of HSN enhancers. Of note, our analysis still shows a high rate of false positives, which suggests that additional features are present in HSN functional enhancers. Future analyses based on more complex paradigms should facilitate the identification of such features that could include additional TFBS (or the absence of repressor sites) or specific syntactic rules. The diversity of C. elegans serotonergic neuronal classes (NSM, ADF and HSN) contrasts with that of tetrapod vertebrates, in which serotonergic neurons are limited to the raphe system (Flames and Hobert, 2011). Other chordates contain additional serotonergic populations (Flames and Hobert, 2011) and serotonergic subclass diversity is also prevalent in other phyla such as arthropoda and mollusca (Flames and Hobert, 2011), which suggests a loss of serotonergic diversity in the tetrapod branch. As in nematodes, serotonergic subclass specification in other organisms is likely to be independently regulated. For instance, in Drosophila, the TFs islet, hunchback and engrailed are required for serotonergic specification of the ventral ganglion, while are dispensable for fly brain serotonergic specification (Lundell et al., 1996; Thor and Thomas, 1997). Similarly, in zebrafish, Pet1 regulates raphe serotonergic specification but is dispensable for the specification of other serotonergic subclasses (Lillesaar et al., 2007). Considering the homologous regulatory network between HSN and mouse raphe and their molecular proximity, our results suggest that the C. elegans HSN serotonergic neuron, but not the NSM or ADF, could share deep homology with mouse raphe neurons. It would be interesting to explore if NSM or ADF regulatory programs show homology to any of the programs controlling the non-raphe serotonergic populations present in other organisms. Noteworthy, despite the homology in TFs regulating HSN and raphe specification, both systems also show discrepancies. For example, while the LIM TF Lmx1b is known to be a key player in mouse serotonergic differentiation (Ding et al., 2003), we failed to identify a similar role for any C. elegans LIM TF (A.JM and N.F unpublished). Similarly, while C. elegans GATA factor egl-18 has very redundant effects on HSN differentiation, GATA2/3 factors are fundamental in mouse serotonergic differentiation (Haugas et al., 2016). Considering the evolutionary distance between mammals and nematodes, the complexity of the regulatory network (composed in C. elegans at least by six and most likely more factors) and the fast evolutionary rate of regulatory regions, it is conceivable that the ancestral common serotonergic regulatory network has significantly diverged between these two animal groups. We propose that this deep homology might be the result of a common ancestor cell type, although, as we do not have enough information about the serotonergic regulatory programs in other animal groups, an alternative scenario is that they might have arisen independently in nematodes and vertebrates and thus although some components would have been convergently employed others could be species specific. If HSN and mouse raphe serotonergic neurons were homologous cell types, we would predict that they are also functionally homologous. Serotonergic systems in all animal groups function as facilitators of motor output, with 5HT promoting a switch between states (Gillette, 2006). Interestingly, C. elegans 5HT signaling in HSN neurons also facilitates motor output. Egg-laying behavior transitions from inactive to active states of egg laying, and 5HT signaling in HSN mediates the onset of the active phase (Waggoner et al., 1998). Thus, HSN and mouse serotonergic neurons would share deep homology, as well as molecular and functional homology. Deep homology of specific nervous system structures has been previously proposed. Conserved TF expression patterns in annelid antero-posterior nervous system axis, including the serotonergic progenitor region, was used to propose the existence of a common Bilaterian ancestor with centralized nervous system (Denes et al., 2007; Tomer et al., 2010). Additionally, homologous TF expression patterns have also been used to propose the presence of a visceral nervous system in the common Bilaterian ancestor (Nomaksteinsky et al., 2013). Altogether, these results suggest that, despite considerable divergence in neuronal architecture and connectivity, deep homology could underlie the specification of diverse neuron subtypes. The identification of homologous regulatory programs could help identify homologous neuronal types in distant species. C. elegans culture and genetics were performed as described (Brenner, 1974). Strains used in this study are listed in Supplementary file 3. Animals of C57Bl/6JRccHsd genetic background were housed in an animal care facility with a 12 hr dark/light cycle and had free access to food and water. All experiments were performed according to the animal care guidelines of the European Community Council (86 ⁄ 609 ⁄ EEC) and to Spanish regulations (RD1201 ⁄ 2005), following protocols approved by the ethics committees of the Consejo Superior Investigaciones Científicas (CSIC). Gene constructs for cis-regulatory analyses were generated by cloning into the pPD95.75 vector. For the identification of the putative binding sites the following consensus sequences were used: ETS: CGGAWR (Wyler et al., 2016), GATA: GATA (Merika and Orkin, 1993); HLH: CAGAA/ACGTG MatInspector Software (Cartharius et al., 2005); INSM: KNNWGSGG (Breslin et al., 2002); SPALT: TTGTST (Toker AS 2003) and MatInspector Software (Cartharius et al., 2005); POU: WTKCAT (Weirauch et al., 2014) and (Sze et al., 2002). Mutagenesis was performed by Quickchange II XL site-directed mutagenesis kit (Stratagene, Santa Clara, CA). Reporters for HSN regulatory signature analysis were generated by fusion PCR (Hobert, 2002). Generated strains and primers are listed in the Supplementary file 3 and 4. For hlh-3 mutant rescue experiments, the entire coding sequence of hlh-3 was cloned in front of the heat shock inducible promoter (hsp16-2). The transgenic DNA mix was composed by hlh-3 cDNA (50 ng/µl), together with the co-injection markers rol-6(su1006) (50 ng/µl) and ttx-3::mCherry (50 ng/µl). For HSN precocious maturation experiments, cDNAs of ast-1 and hlh-3 were amplified by PCR and cloned in front of an HSN-specific promoter that drives early expression in the HSN (see promoter sequence below) and the transgenic DNA mix concentrations were the same as above. When both cDNAs were co-injected, we used 25 ng/µl for co-injection markers. For rescue experiments, cDNAs corresponding to the entire coding sequence of ast-1, hlh-3, egl-46, Pet1, Ascl1, Insm1, Sall2 and Gata2 were amplified by PCR and cloned in front of cell-specific promoters: bas-1prom, cat-4prom and kal-1prom (primers in Supplementary file 4). The transgenic DNA mix was composed by the DNA of interest [ast-1 (50 ng/µl in HSN early maturation experiments and 5 ng/µl in HSN rescue experiments), hlh-3 (50 ng/µl), egl-46 (50 ng/µl), Pet1 (10 ng/µl), Ascl1 (50 ng/µl), Insm1 (50 ng/µl), Gata2(50 ng/ul) and Sall2 (20 ng/µl)], the co-injection markers rol-6(su1006) (50 ng/µl) and ttx-3::mCherry (50 ng/µl) and, when necessary, pBlueScript as carrier DNA. DNA was injected into N2 animals and then crossed with their respective mutant strains. ast-1 and hlh-3 reporter strains were generated using CRISPR/Cas9-mediated fluorescent protein knock-in, as described in (Dickinson et al., 2013; Dickinson et al., 2015). For homology arm recombination, we used plasmids containing a self-excising selection cassette: the GFP-containing pJJR82 plasmid (Addgene, Cambridge, MA) in the case of ast-1, and the mNeonGreen-containing pDD268 plasmid (Dickinson et al., 2015) in the case of hlh-3. To target Cas9 to the specific genomic locus, we used the single guide RNA sequence GGGGTGACTATCGATAAAGA for ast-1, and GCTATGATGATCACCAGAAG for hlh-3, cloned in the pDD162 (Addgene) and the pJW1219 (Addgene) plasmids respectively. Injection mixes consisted on the Cas9–sgRNA plasmid (50 ng/µl for ast-1 and 100 ng/µl for hlh-3), the repair template (10 ng/µl for ast-1 and 20 ng/µl for hlh-3), and a pharyngeal co-injection marker [2.5 ng/μl pCFJ90 (Pmyo-2::mCherry); Addgene]. Scoring and images were performed using 60X objective in a Zeiss Axioplan2 microscope. Lack of GFP signaling was considered OFF phenotype. As we observed no appreciable bias in reporter expression between left and right HSN neurons, percentages were calculated regardless of side. cis-regulatory reporter and mutant scoring was performed using young adult worms maintained at 25°C, unless indicated. For cis-regulatory analysis a minimum of 30 animals (60 HSN cells) per line were scored. For mutant analysis at least 100 HSN cells, roughly corresponding to 50 animals, were scored for each genotype. For double mutant analysis, we scored young adult worms and we included an extra phenotype category termed ‘dim’ whenever fluorescence was obviously reduced but still detectable. For HSN regulatory signature analysis, the three lines showing strongest GFP under the dissecting scope were selected for scoring under the microscope. To prepare figures for publication, images were cropped and rotated, brightness and contrast were adjusted, and maximum intensity projections (where applicable) were performed using FIJI. No other image manipulations were performed. For wild type TF expression analysis at HSN birth, an unc-86 fosmid reporter was crossed with the desired TF reporter in order to construct double reporter strains, when possible. UNC-86 is expressed in the HSN after cell cycle exit, approximately 400 min after fertilization and coinciding with embryonic comma stage, which was chosen as analytical time point (Desai et al., 1988; Finney and Ruvkun, 1990). In the particular case of hlh-3, 1 to 2 cell-stage embryos with the endogenous gene tagged were selected and mounted [0 hr post-fertilization (hpf) to 0.8 hpf, respectively], incubated at 25°C and analyzed at different time points. We determined that HLH-3 is initially expressed in the HSN/PHB precursor cell (approximately five hpf) and maintained in the postmitotic HSN. HSN cells were identified relative to nearby landmark cell deaths (Sulston et al., 1983). The rest of developmental stages of the worm were identified by standard anatomical features. For hlh-3 mutant time-specific rescue experiments using the hsp16-2 promoter, synchronized worms were grown until early L4 larva stage, when they received three heat shock pulses (30 min at 37°C) with 2 hr resting intervals. Animals were analyzed the next morning at young adult stage. Data was categorically classified as ‘on’ or ‘off’ and the significance of the association was examined using the two tailed Fisher’s exact test. For double mutant analysis, ‘phenotype’ vs. ‘no phenotype’ was compared and thus, ‘dim’ and ‘off’ were considered under the category ‘phenotype’. The null hypothesis was that the level of expression in the double mutant would be equal to the product of the levels of expression in single mutants (Mani et al., 2008). Whatever statistically deviated from the expected, was considered genetic interaction; Pearson’s chi-squared test was used. C. elegans serotonin antibody staining was performed using the tube fixation protocol (McIntire et al., 1992). Briefly, synchronized young adult hermaphrodites were fixed in 4% paraformaldehyde (PFA) for 18 hr, with β-mercapto-ethanol for another 18 hr, with 1 mg/ml collagenase (Sigma Aldrich, Merk, Darmstadt, Germany) for 90 min and incubated for 24 hr with rabbit anti-5HT antibody (1:5000; Sigma Aldrich). Alexa 555-conjugated donkey anti-rabbit (1:500; Molecular probes) was used as secondary antibody. For mouse immunohistochemistry, freshly isolated E11.5 embryos from C57Bl/6JRccHsd were fixed by immersion in 4% PFA. Rabbit anti-Sall2 (1:100; Sigma Aldrich), goat anti-Brn2 (1:100; Santa Cruz Biotechnology, Santa Cruz, CA), rabbit anti-5HT (1:5000; Sigma Aldrich) and goat anti-5HT (1:200; Abcam, Cambridge, UK) antibodies were used. As secondary antibodies Alexa 555-conjugated donkey anti-rabbit and anti-goat, and Alexa 488-conjugated donkey anti-rabbit and anti-goat were used (1:600; Molecular probes, Invitrogen, Eugene, OR). Immunofluorescence samples were analyzed and photographed using a confocal TCS-SP8 Leica microscope. * Mutated nucleotides with respect to tph-1prom2 are indicated in lowercase letters. RNAi experiments were performed by the standard feeding protocol (Kamath et al., 2003). rrf-3 (pk1426) background was used to sensitize worms to the RNAi effects. For maintenance experiments, animals were grown under normal food (OP50) until young adult stage. At this stage we scored tph-1::yfp and cat-1::MDM2::gfp expression in the HSN to confirm that all animals expressed the fluorescent protein and then we transferred animals to RNAi plates with HT115 bacteria (Novagen) transfected with RNAi clones. Worms were incubated at 15°C for 72 hr and then HSN fluorescent expression was scored. For F1 RNAi scoring, we bleached gravid adults in OP50 plates, eggs were allowed to hatch and worms grew in RNAi treated food. We scored their progeny, which had developed under the embryonic effects of RNAi knock down (F1 scoring). The experiment was performed in two independent replicates with similar results. As a negative control the L4440 empty vector was used (pPD129.36, Addgene). Full-length unc-86 and ast-1 cDNA into the pET-21b His tag expression vector (EMD Millipore, Merk) were kindly provided be Oliver Hobert. They were transformed into E. coli Rosetta2 (DE3) (Novagen) strain. Overexpression was done by first growing the cells at 37°C in LB and Power Broth medium (Molecular Dimensions) respectively, supplemented with 100 μg/ml ampicillin, 100 μg/ml chloramphenicol to OD600 = 0.5–0.6 and then inducing expression with 0.5 mM iso-propyl-b-D thiogalactopyranoside (IPTG, Acros Organics, Thermo Fisher, Waltham, MA) at 37°C for 3 hr or 20°C for 16 hr, respectively. UNC-86 protein was obtained as previously explained (Zhang et al., 2014) with minor changes. Briefly, cells were collected by centrifugation and resuspended in buffer A (100 mM NaH2PO4,10 mM Tris [pH 7.5], 10% glycerol) supplemented with 1 mM phenylmethanesulfonyl fluoride (PMSF). Cells were lysed by sonication. Soluble and insoluble fractions were separated by centrifugation and analyzed by SDS/PAGE. Protein was substracted from insoluble fraction as follow: insoluble fraction was resuspended in solubilization buffer (buffer A supplemented with 8 M urea) and loaded on a pre-equilibrated His Trap HP column (GE Healthcare, Chicago, IL). The resin was washed with solubilization buffer supplemented with 10 mM imidazole, and protein was eluted with the same buffer supplemented with 500 mM imidazole. Elution buffer was exchanged by progressive dialysis to 20 mM HEPES [pH 7.5], 100 mM NaCl 10% glicerol, 2 mM MgCl2, and the protein was concentrated by centrifugation up to 1.3 µg/µl and stored at −80°C. For AST-1 protein, cells were collected by centrifugation and resuspended in buffer B (200 mM MES [pH 6.0], 500 mM NaCl, 2 mM MgCl2, 10% glycerol) supplemented with 1 mM PMSF. Cells were lysed by sonication and soluble proteins were loaded on a His Trap HP column (GE Healthcare) pre-equilibrated with buffer B. The resin was washed with buffer B supplemented with 10 mM imidazole, and protein was eluted with buffer B supplemented with 300 mM imidazole. Eluted fraction was analyzed by SDS/PAGE. Imidazole was removed and protein concentrated by centrifugation up to 0.3 µg/ul, and stored at −80°C. egl-18 cDNA was cloned into pcDNA.3 vector followed by His tag sequence and transfected with Lipofectamine-2000 (Invitrogen) in HEK293T cells. HEK293T cells were grown in DMEM 10% FBS. After 24 hr, cells were lysed with the following buffer: 1 mM EDTA, 0.5% Triton, 20 mM β-glicerolP, 0.2 mM PMSF, 100 µM Na3VO4 and protease inhibitor. EMSAs were performed incubating UNC-86 and AST-1 proteins in a buffer containing 10 mM Tris [pH 7.5], 50 mM NaCl, 1 mM MgCl2, 4% glycerol, 0.5 mM DTT, 0.5 mM EDTA, 1 µg of poly(dIdC), 6 µg of bovine serum albumin and labeled probes for 20 min at room temperature. For EGL-18, protein extracts were incubated in 20 mM Hepes, 50 mM NaCl, 5 mM MgCl2, 5% glycerol, 1 mM DTT, 0.1 mM EDTA, 1 µg of poly(dIdC), 6 µg of bovine serum albumin and 1 µg anti-6xhistag antibody (Abcam) at 4°C for 30 min. As negative control, anti-GFP antibody (Roche, Basel, Switzerland) was used. Then, labeled probes were added and incubated for 20 min at room temperature. Finally, samples were loaded onto a 6% (37.5:1 acrylamide: bisacrylamide) gel and run at 150 V for 4 hr. Gels were then dried and visualized using Fujifilm FLA-500. Probe sequences are listed in Supplementary file 4. Primers were annealed and end-labeled with ATP [γ−32P] (Perkin Elmer, Waltham, MA) using T4 PNK (Thermo Scientific) according to the manufacturer’s specifications. Unless otherwise indicated, all the analyses were performed using R and Bioconductor (Huber et al., 2015). For C. elegans regulatory signature analysis, we built PWMs from the functional motifs found in the 5HT pathway genes CRMs (Figure 5). Next, we downloaded upstream and intronic gene regions from WormBase version 262 and classified genes in three groups: genes known to be expressed in HSN, genes expressed in neurons and non-neuronal genes, according to WormBase annotations on gene expression and/or belonging to the published neuronal genome (Hobert, 2013). PWMs were aligned to genomic sequences and we retrieved matches with a minimum score of 70%. To increase specificity, we removed all matches that did not bear an exact consensus sequence for the corresponding TF family (ETS: YWTCCG, GATA: DGATAD, HLH: SCAGAA, INMS: CCSCWNNM, SPALT: TTGTST, POU: WTKCAT). Then, we performed a sliding window search to find regions that included at least one match for four or more of the 6 TF types. Windows were separated according to the number of different motifs that they bore (4, 5 or 6), and then overlapping regions were merged. Embryonic stem cell enhancers median size has been reported to be around 800 bp (Parker et al., 2013); therefore, the initial search was performed with a maximum length restriction of either 600, 700 or 800 bp. Differences between HSN-expressed genes and other gene groups was greater when the maximum length was set to 700 bp, thus we kept this maximum window length for the rest of the analyses. To assess enrichment in signature in HSN-expressed genes we sampled 10,000 groups of 96 genes that (1) had not previously been reported to be expressed in the HSN, (2) at least one ortholog had been described in other Caenorhabditis species (C. briggsae, C. japonica, C. remanei or C. brenneri), and (3) such that their upstream and intronic regions were similar in length, on average, to those of the HSN-expressed genes (Mann-Whitney U test, p-value>0.05). We compared the distribution of the proportion of genes with signature (4, 5 or 6 different motifs) in these groups to the HSN-expressed gene group. We consider the enrichment in signature to be significant when the percentile of the HSN-expressed group is above 95. In order to assess signature conservation, we performed a similar motif search using other nematode genomes also available from WormBase (C. briggsae, C. japonica, C. remanei, C. brenneri) and we considered the signature to be conserved if HSN regulatory windows were found in all orthologous genes, at least 4, 5 or 6 motifs for 4, 5 and 6-motif C. elegans windows. Gene ontology analysis was performed using GOrilla software, using C. elegans coding genome (19.276 genes) as control list (Eden et al., 2009). For hierarchical clustering, we used curated data from WormBase (Hobert et al., 2016) to generate a matrix with gene expression profiles for the 118 C. elegans hermaphrodite anatomical neuronal classes. Pan-neuronal genes and neurons in which less than 30 genes had been reported to be expressed were excluded. We built a similar matrix with mouse gene expression data from RNA-seq experiments, either from adult raphe nuclei divided into different rhombomeres (R1Dorsal, R1 Medial, R2, R3, R5, R6) (Guillemot and Hassan, 2017) or from cortical neurons that served as negative control (Molyneaux et al., 2015)). To transform the quantitative RNA-seq data into a presence-absence binary matrix. We considered values above 19 CPM as present and values below that threshold as absent because this cut-off produces a list of approximately 7000 expressed genes in each Raphe sample (roughly a third of the genome that is what is being estimated as expressed in a given cell type). Nevertheless, results were consistent in all conditions when considering cutoffs ranging from 9 to 140 CPM, after which HSN-raphe cluster robustness started to decline (low AU and BP values, not shown). To assign mouse ortholgs to C. elegans genes, we combined orthology relationships between mouse and worm genes annotated in the ENSEMBL database and worm-human orthology relationships reported in Shaye and Greenwald (2011). In the last case, we used ENSEMBL database again to assign mouse orthologs to human genes. In (Molyneaux et al., 2015)), ENSEMBL, OrthoMCL, InParanoid and Homologene methods are combined to identify orthologs. Thus, we combined both sources to have a wider coverage of orthology relationships than using ENSEMBL or (Molyneaux et al., 2015) data alone. Worm genes without any mouse ortholog and genes that were not expressed in any worm neuron were removed. Whenever a worm gene had more than one mouse ortholog, it was duplicated in the worm data set. For hierarchical clustering, this binary matrix containing mouse and worm expression data was fed to the pvclust function in the pvclust R package (Shimodaira, 2002), which uses a bootstrapping technique to calculate p-values for each cluster, the AU and BP values (Shimodaira, 2002). Parameters were set as follows: method.hclust = ‘average’, method.dist= ‘binary’, nboot = 10,000, r = seq(0.5, 1.4, by = 0.1). The standard error of the PV and AU values was approximately 0.1% for most clusters, including the HSN-raphe cluster. Also, as a control, 100 random sets of 96 expressed genes (the same number of genes that are expressed in the HSN) were generated from the worm gene pool. Each random set contained the four 5HT pathway genes (tph-1, cat-1, cat-4 and bas-1) plus 92 randomly picked genes from the genes expressed in C. elegans neurons. This data set was merged with mouse raphe nuclei expression profile and pvclust was run as before. Annual Review of Neuroscience 34:153–184. Integrative and Comparative Biology 46:838–846. Proceedings of the National Academy of Sciences 114:E1291–E1300. Current Opinion in Neurobiology 42:93–101. Current Topics in Developmental Biology 116:455–475. Molecular and Cellular Neuroscience 7:46–61. Proceedings of the National Academy of Sciences 105:3461–3466. Molecular and Cellular Biology 13:3999–4010. Genome Biology and Evolution 6:1145–1156. Proceedings of the National Academy of Sciences 110:17921–17926. Current Opinion in Genetics & Development 43:73–81. An approximately unbiased test of phylogenetic tree selection. The Journal of Neuroscience 36:1758–1774. Thank you for submitting your work entitled "A combinatorial transcription factor signature defines the serotonergic neuron regulatory landscape" for consideration by eLife. Your article has been favorably evaluated by a Senior Editor and three reviewers, one of whom is a member of our Board of Reviewing Editors. The reviewers have opted to remain anonymous. Our decision has been reached after consultation between the reviewers. Based on these discussions and the individual reviews below, we regret to inform you that your work will not be considered further for publication in eLife in its current format. We have opted to include the full reviews below. As you will see, all reviewers are potentially interested in the work, but all ask for extensive revisions and additional experiments to support the conclusions. Although we are unable to move forward with the current version of the manuscript given the extent of the requested revisions, if you agree with the reviewers and are willing and able to do the extensive work outlines below we do encourage you to consider eLife again for submission of a revised manuscript once the issues raised below have been addressed. The manuscript will be considered a new submission. If, on the other hand, you do not agree with the reviewers, please do not do experiments you don't consider worthwhile or merited, but instead submit your manuscript elsewhere. - The work is extensive and detailed (but see below) and the conservation with mouse serotonergic neuron regulatory mechanisms is encouraging. - I am bothered by the strong conclusions the authors draw from looking at single alleles of genes. Given the variable penetrance of the observed expression phenotypes, some of this could easily arise from background effects. - It wasn't clear to me that they had carefully looked at developmental time courses for expression in the various single and double mutant backgrounds. It looked like only adults were scored. In other words, it is possible that some of these regulators may play a role in defining the temporal patterns of expression? Ectopic temporal expression could also disrupt development. - I didn't understand how mutating hlh binding sites leads to an effect if HLH-3 is not expressed in the adult. - It seems important to look at expression upon mutating multiple TF binding sites and not just at double mutants for the TFs. - Finally, I am just not sure how much we've learned from looking at this single neuron. Perhaps this is not a fair criticism but given the data, it's not even clear to me that the authors can make very strong statements about what they've learned. 2) Developmental and evolutionary standpoint: This study identifies the major TFs essential for serotonergic neurons in C. elegans, a set of 6 factors with very different DNA binding domains, which have a deeply conserved role in serotonergic neuron development. In reading the paper, I found it very strange to talk about regulatory codes (subsection “Transcription factors from six different families are required for HSN 3 neuron terminal differentiation”) when describing Figure 1 and 2. At least to me, codes refer to something in the DNA sequence, while the first two figures describes the proteins involved, their loss-of-function phenotypes, and their expression. For example, – "…this set of six TFs that we refer as the HSN TF code". As you have already referred to the TF collective in the Introduction, why not already call it a TF collective here rather than code or simply 'the HSN TFs' and then define it as a HSN TF collective later as you currently do. The analysis of enhancer activity in the double mutants showing synergy etc. is very nice – but some of these embryos are quite messed up. To avoid pleiotropic functions that could lead to secondary effects have you tried making double mutants in the TFBSs of the analyzed enhancers? This would be a very nice complement to Figure 5. The motif prediction section is very interesting. Given your genetic dissection showing that for a given TF, its TFBS are essential for some enhancers and indispensable for others in keeping with the TF collective mode of regulation, I was surprised that the authors required the presence of all 6 TFBSs. I realize that you wanted to make the screen as stringent as possible – and even with all 6 conserved only ~35% of the predictions are expressed in the correction tissue (as you discuss very openly). Given the apparent plasticity in the system, it would be very interesting to do the same computational analysis searching for elements that contain any 5 and any 4 of the 6 TFBS. Does this decrease your enrichments or not make any difference (as the collective model would propose)? - "Of note, 5HT pathway gene CRMs are not completely independent as in some cases they partially overlap (Figure 3)." Just because the elements have overlapping expression doesn't mean that they are not acting independently. By independent do you mean each enhancer functions as an independent autonomous unit? Or that they are regulated by independent (unique) sets of TFs? The deep homology of the system is really interesting, and the rescue of the worm mutants with the human factors is very impressive. Actually, I suggest to consider moving this down (Figure 7D) to the end of the figure. Start with the expression of the mouse genes, then the expression comparison to the mouse 5HT raphe suggesting deep homology specifically to the HSN neurons. To test this deep homology you then determined if the mouse TFs could rescue the C. elegans mutants, suggesting that the underlying regulatory network is also conserved. In this manuscript, the authors use C. elegans to study transcription factor combinations that are responsible for the differentiation of HSN, a specific class of serotonergic neurons. They identify six transcription factors based on their egg laying phenotype, as well as the absence of serotonin production in mutant cells. They argue that these transcription factors act in parallel and synergistically to regulate the serotonergic regulatory landscape. They study the enhancers of genes involved in the serotonin biosynthetic pathway where they identify the binding sites for these six transcription factors. They use this information to try to find more genes that are regulated by these transcription factors. Although they manage to do so, they have a very high number of false positives. Then, they use the mouse orthologs of these transcription factors to see if they can drive HSN differentiation in worms. Finally, using transcriptomic data they conclude that the HSN neurons are homologous to the mouse raphe serotonergic neurons. The manuscript has a number of interesting results, but there is a lot of missing information. The interpretation of the results is often exaggerated and many conclusions are extrapolated from patchy data. - The title is misleading. The authors advertise the TF combination as regulating serotonergic neurons, while they are only studying one serotonergic type. In fact, the other serotonergic neurons are minimally affected in these TF mutants. - The authors are obviously missing a number of important transcription factors that participate to the differentiation of these neurons. Therefore, this makes most of their downstream results (that is synergy and epistasis) hard to interpret. The way the authors came up with their candidates is very biased towards genes that do not have embryonic lethal phenotypes; in fact, most transcription factors are re-used in different contexts, including embryogenesis. - Very importantly, the authors observe many non serotonin-related genes being affected in the TF mutants. This means that they are obviously also interfering with the differentiation of the HSNs! Some genes like kcc-2 and lgc-55 are affected equally to the serotonergic pathway genes, while serotonergic pathway genes, such as cat-4, are affected less than some terminal features. However, the authors conclude: "This indicates that HSN partially differentiates, but fails to activate expression of the complete HSN transcriptome". An equally possible conclusion is that they are affecting the differentiation of HSNs, but since they are missing many TFs from their collection, they only affect it partially. - How is HLH3 important for the serotonergic identity when it is not expressed in the adults? The neurons do continue to synthesize serotonin in adult worms. It could be acting as a pioneer factor, or it could be relaying its activity to a downstream transcription factor, but the authors never address this. - In Figure 2E, can the authors really decide on the fate maintenance based on one marker? Moreover, most of the TFs have a very minimally (although significantly) penetrant effect. Do they believe that the egg-laying defect is because of this effect? Could it be that this mutant is affecting other cell types that are causing the egg-laying defects? - As stated earlier, Figure 5 is quite confusing. It shows complex regulatory interactions that cannot be put in a model, as the data are incomplete. Moreover, the authors are testing only TFs with low penetrance and are extrapolating for the whole series. Congratulations, we are pleased to inform you that your article, "A combinatorial transcription factor signature defines the HSN serotonergic neuron regulatory landscape", has been accepted for publication in eLife. This is a detailed analysis of the TF network that specifies the differentiated characteristics of a single serotonergic neuron type in C. elegans. The authors show that a "TF collective" comprised of 6 TFs specify this neuron's fate in contrast to the master selector model. Mammalian orthologs are able to substitute for the worm TFs and are expressed in 5-HT neurons, suggesting a deep conservation. Although the first version of this manuscript was rejected, the authors performed a large number of experiments and both reviewers have concurred that they have addressed all the previous comments very well. We thank the reviewer for this important remark. We have now included the quantification of at least two alleles for each member of the HSN TF collective. For each allele the expression of at least two 5HT pathway gene reporters and 5HT staining defects are analyzed. We also include RNAi phenotypes for tph-1 and cat-1 expression for each HSN TF collective member. These results, described now in the text (subsection “Transcription factors from six different families are required for HSN neuron terminal differentiation”, third paragraph) and in Figure 1—figure supplement 1 and Supplementary file 1, show that HSN phenotypes are due to mutations in the TFs and not to background effects. We did not include this data in the original submission for simplicity and we realized now that it is an important piece of information. We thank very much the reviewer for pointing this out. As stated by the reviewer, dysregulation of temporal expression is also a phenotype important to consider. We apologize for not being clear enough on the role of HLH-3, as also pointed by reviewer #3. In the revised version of the manuscript we have tried to clarify this issue with additional experiments and re-writing of the section: detailed analysis of hlh-3 expression by GFP fusion to HLH-3 in the endogenous locus (Figure 2—figure supplement 1A) shows that, post-embryonically, HLH-3 starts being expressed in the HSN at third larval stage and its expression is highest at late third larval stage and early forth larval stage, this expression shortly precedes and overlaps onset of expression of most HSN effector genes (Figure 2—figure supplement 1C). We also demonstrate that hlh-3 postembryonic expression in hlh-3 mutants is sufficient to rescue tph-1 expression defects (Figure 2C). Taking into account that we found functional bHLH binding sites in tph-1 and cat-1 CRMs (Figure 5), altogether our data supports the hypothesis that hlh-3 function is directly required to initiate expression of some HSN effector genes. A role for TFs exclusively in initiation but not maintenance has been previously reported. For example, embryonic ttx-3 expression in AIY neuron is dependent on the TF REF-2 but its maintenance of expression does not require REF-2 but TTX-3/CEH-10 activity (Bertrand and Hobert, 2009). There are also examples in mouse of TFs required for establishment but not maintenance of cell fate (Bettess et al., 2005, Hoogenkamp et al., 2009, Martins et al., 2005) or required for maintenance but not initiation of expression (Galceran et al., 2001, Harms et al., 2014). HLH-3 belongs to the Asc proneural factor family and is ortholog to mouse Ascl1 (Figure 2—figure supplement 1D). Ascl1 is expressed in serotonergic progenitors and early postmitotic serotonergic neuroblasts. Besides its role in neuronal progenitors specification it has well-demonstrated roles inducing neuronal differentiation in serotonergic and other neuronal types (Pattyn et al., 2004, Sommer et al., 1995). Ascl1 is also part of the TF combinations used to induce serotonergic fate from human fibroblasts (Vadodaria et al., 2015, Xu et al., 2015). Similar to hlh-3, Ascl1 expression is downregulated from mature neurons. Temporal dysregulation of Ascl1 activity by sustained expression or inhibition of degradation leads to neuronal differentiation defects (Imayoshi et al., 2013, Urbán et al., 2016). Similarly, we observed that precocious and sustained expression of hlh-3 leads to HSN differentiation defects (Figure 2D). hlh-3 function shows additional shared features to Ascl1 like regulation of expression of panneuronal features (see rab-3 expression defects Figure 1E) or being an upstream regulator of egl-46 (Figure 3A) (Ascl1 directly regulates Insm1, ortholog of egl-46) (Castro et al., 2011). Finally, Ascl1 can substitute hlh-3 function in HSN differentiation (Figure 8F). Altogether our new data suggest that in the HSN TF collective hlh-3 acts as a proneural gene in the induction of HSN terminal fate. Ascl1 has been shown to act as a pioneer factor to facilitate binding of additional TFs (Wapinski et al., 2013). It would be very interesting to address if HLH-3 can also bind closed chromatin. We have not addressed this issue in the manuscript because we think it is out of the scope of the paper, the main message of the paper is the identification and characterization of HSN TF collective as a whole, our ability to predict HSN enhancers and the phylogenetic conservation. We believe that a more detailed analysis on HLH-3 function as proneural factor is a project on its own for future manuscripts. This data is now explained in the subsection “AST-1 acts as temporal switch for HSN maturation” and Figure 2 and (Figure 2—figure supplement 1). We thank reviewer #1 for this suggestion, also proposed by reviewer #2. We have now performed these experiments that are summarized in Figure 6—figure supplement 1. Double cis mutant analysis was limited to the few TFBS that produce partial loss of expression upon mutation. This reduced the number of possible constructs to four. We analyzed three of these four combinations and found that they produce epistatic effects but not synergistic effects. We still don´t know why we did not find synergy (even in genes for which corresponding double trans mutants did show synergy), one possible explanation is that, considering the function of HSN TF collective as a whole, TFBS mutations could be more easily compensated than mutations in the corresponding trans-activating factors. To widen our analysis for genetic interactions in the HSN TF collective and trying to minimize TF pleiotropic effects we also performed several cis-trans double combinations (Figure 6I). In this context we found synergy as well as additivity and suppression effects. Altogether our double mutant analysis (both cis and trans) is in agreement with the HSN TF collective model that predicts extensive synergy among factors and supports the idea of physical interactions or facilitation of DNA accessibility among TFs. It also shows the great flexibility of the system as specific CRM structure and context determines double TF effects in the regulation of each particular gene. This information is now in the subsection “HSN TF collective shows enhancer-context dependent synergistic relationships” and in Figure 6 and Figure 6—figure supplement 1. 1) As pointed earlier by reviewer #1, our work on the HSN logic shows a different picture, much more complex than previously presented for other C. elegans neurons. We think this is not due to an intrinsic difference in the HSN, but to the exhaustive analysis we have performed. Describing this complexity is important because the data available so far created the false impression that C. elegans cell fate regulation was different and much simpler than in other organisms and thus could follow different rules see for example review (Holmberg and Perlmann, 2012). (This concept is explained in the first section of the Discussion). 2) Three models have been proposed to explain enhancer function: the enhanceosome model, billboard model and TF collective model. It is still a matter of debate which model better represents TF way of action. There are several beautiful examples that fit the TF collective model mainly, but not only, in Drosophila embryo. To our knowledge our work is the first characterization in great detail of the action of a TF collective model in the neuronal subtype terminal differentiation. Moreover our detailed examination on the HSN TF collective function has allowed us to describe a high degree of flexibility as well as extensive synergistic relationships further supporting the TF collective model. (This concept is also explained in the first section of the Discussion). 3) Despite great efforts, we still do not understand why specific regions in the DNA constitute functional enhancers. This lack of understanding precludes us from identifying cis-regulatory modules only based on DNA sequence. Although we are still far from reaching this goal, our work shows that the complexity of the HSN TF collective, composed by at least six members (and most likely by additional TFs) impose a regulatory signature that is specific enough to identify enhancers only from DNA sequence. Our understanding is still incomplete, what produces a high number of false positives in our search, nevertheless, we think it provides an important proof of concept that could help in the understanding of enhancer selection. (Explained in the second section of the Discussion). 4) Finally, our work shows an unexpected degree of homology between the HSN and the mouse raphe. Both terminal features as well as TF regulatory network seem shared between these two populations. From an evolutionary point of view we think this finding is very relevant and suggests that eumetazoans might share deep homology in additional neuron types. (Explained in the third section of the Discussion). 4) Regulation of expression of identified HSN active enhancers by unc-86 (motifs (Figure 7—figure supplement 3). […] In reading the paper, I found it very strange to talk about regulatory codes (subsection “Transcription factors from six different families are required for HSN 3 neuron terminal differentiation”) when describing Figure 1 and 2. At least to me, codes refer to something in the DNA sequence, while the first two figures describes the proteins involved, their loss-of-function phenotypes, and their expression. For example, "…this set of six TFs that we refer as the HSN TF code". As you have already referred to the TF collective in the Introduction, why not already call it a TF collective here rather than code or simply 'the HSN TFs' and then define it as a HSN TF collective later as you currently do. We thank reviewer #2 for this very constructive remark. We now realize the term 'code' is confusing and not properly used in the text. As the term 'TF collective' entails the direct action of TFs upon the co-regulated genes we decided to only use HSN TF collective after determining functional binding sites in the HSN CRMs. We have now eliminated the expression 'HSN TF code' from the text and replace it by the 'HSN TF combination' that we think is more appropriate. We thank reviewer #2 for this suggestion, which is also proposed by reviewer #1. As stated by reviewer #2 double mutants can show enhanced secondary effects, indeed a clear example is that although both egl-18(ok290) and ast-1(ot417) are viable double mutants are embryonic lethal. Following reviewers suggestions we have now performed these experiments that are summarized in Figure 6—figure supplement 1. Double cis mutant analysis was limited to the few TFBS that produce partial loss of expression upon mutation. This reduced the number of possible constructs to four. We analyzed three of these four combinations and found that they produce epistatic effects but not synergistic effects. We still don´t know why we did not find synergy (even in genes for which corresponding double trans mutants did show synergy), one possible explanation is that, considering the function of HSN TF collective as a whole, TFBS mutations could be more easily compensated than mutations in the corresponding trans-activating factors. We thank reviewer #2 for this suggestion. As pointed by the reviewer, we performed our initial analysis as stringent as possible to try to get the 'best possible prediction'. However, also as stated by reviewer, TF collective model predicts that in some contexts, specific TFBS are dispensable. Our lack of understanding of the details in the organization and disposition of the specific TFBS makes yet impossible to predict in which specific contexts one TFBS is absolutely required or just dispensable. We have performed similar prediction analysis considering regulatory windows with any five or any four motifs and compared them to the original six -motif analysis. Our results are summarized in the subsection “The HSN regulatory signature allows de novo identification of HSN expressed genes” and in Figure 7—figure supplement 2. In summary, we find that in contrast to our analysis with 6 motifs, only five or only four motif windows are not enriched in genes known to be expressed in HSN compared to random (Figure 7—figure supplement 2A, B). Additionally, inclusion of only five motif regulatory windows (≥5 motif) or both only five and only four motif regulatory windows (≥4 motif) decreases the enrichment in the neuronal genome compared to non neuronal genome and the GO term enrichment on HSN related terms (Figure 7—figure supplement 2C-E). Altogether, our data shows that the most prevalent mark of HSN expressed genes is the regulatory signature with all six TFBS. Even if some HSN active enhancers lack predicted binding sites for any of the members of the HSN TF collective, at the genomic level, including enhancers with missing TFBS abolishes cell type specificity. 'Of note, 5HT pathway gene CRMs in some cases partially overlap (Figure 4)'. We thank the reviewer for this excellent suggestion that improves the flow of the manuscript, we have re-arranged the data from the text and figure accordingly (New Figure 8). […] The manuscript has a number of interesting results, but there is a lot of missing information. The interpretation of the results is often exaggerated and many conclusions are extrapolated from patchy data. - The authors are obviously missing a number of important transcription factors that participate to the differentiation of these neurons. Therefore, this makes most of their downstream results (that is synergy and epistasis) hard to interpret. We completely agree with reviewer #3 that additional unidentified TFs are part of the HSN TF collective, moreover, other TFs are known to be required for earlier events of HSN development such us lineage specification, we have not considered these TFs in our analysis as we are focused specifically in the last steps of HSN maturation. However, we respectfully disagree with the reviewer's claim that, because not all components of the HSN TF collective have been identified, the conclusions from our data are hard to interpret. Biological research is often based on the dissection and analysis of specific parts of complex systems to understand their function. This strategy has been historically very successful to advance our understanding of complex processes. In this context, synergy refers to the relationship between two factors, independently of how many additional factors are involved. Many examples of synergistic relationships have been reported in different organisms in which only a few components of the whole network were considered (see as examples for C. elegans (Chen et al., 2013, Doitsidou et al., 2013, Hsin and Kenyon 1999, Kratsios et al., 2017, Ogg et al., 1997, S Lichtsteiner 1995, Sawa et al., 2000, Sommermann et al., 2010, Wang et al., 2014, Zhang et al., 2013) and for other systems: (Costa et al., 2013, Goldstein et al., 2017, Kottakis et al., 2016, Mazzoni et al., 2013, Rubtsova et al., 2013, Stuart et al., 2014)). All these publications provided useful insights in biology. More specifically, there are other examples of identified TF collective functions in which also additional TFs are missing and nevertheless that provide important insights into the mechanisms of regulation of gene expression (Junion et al., 2012, Uhl et al., 2016). In summary, we believe that our data, both cis-regulatory analysis and double mutant analysis, provides strong evidence that the HSN terminal differentiation fits best the TF collective model of transcriptional regulation in which TFs act together to broadly regulate terminal fate (reviewed in Spitz and Furlong 2012): they interact in some contexts, what can lead to TF recruitment even in the lack of a functional TFBS and accordingly they can show synergistic relationships. The way the authors came up with their candidates is very biased towards genes that do not have embryonic lethal phenotypes; in fact, most transcription factors are re-used in different contexts, including embryogenesis. We completely agree with reviewer #3 in that most TFs, including the HSN TF collective, are pleiotropic. All members of the HSN TF collective are broadly expressed during embryogenesis and have other reported functions either in specification of other neuronal types or even in non-neuronal tissues. However, we would like to clarify that we have not limited our analysis to TFs that are not required for early steps in development. This is precisely the case of ast-1: null ast-1 alleles are L1 larval lethal. However, forward genetic screens and the isolation of hypomorphic mutations allows for the identification of viable alleles in genes that code for TFs that are required for viability, and ast-1 is one of the many examples. Just to mention another case, in the past we isolated a ceh-43 mutant allele that contains a regulatory mutation that specifically affects ceh-43 expression in CEPs neurons, this mutant allele is viable while null alleles of ceh-43 are embryonic lethal. The isolation of this mutation was key in identifying a specific role of ceh-43 in dopaminergic specification (Doitsidou et al., 2013). In summary, 1) we are aware, as we state in the manuscript several times, that other components of the HSN TF collective are yet to be identified. These additional TFs may or may not be required for embryonic development. Nevertheless, this fact does not affect the conclusions driven from our data, 2) a member of the HSN TF collective is required for worm viability (ast-1), demonstrating that we do not exclude from our analysis genes required for embryonic development. We have now included a sentence in the Discussion section acknowledging the possibility that the additional components of the HSN TF collective could have a role in embryogenesis (subsection “Regulation of C. elegans neuron specification is unexpectedly complex”, last paragraph). We apologize if our statement was misleading in the initial version of the manuscript. As well pointed by the reviewer, our data shows that these TFs are required for proper expression of a broad range of HSN terminal features and not only the 5HT pathway genes. This finding is very important for the rest of the manuscript as we find these TFs work according to the 'TF collective model' originally proposed by Furlong lab. Accordingly, HSN TF collective defines the HSN neuron regulatory landscape (and not just the 5HT biosynthesis pathway gene expression). "This indicates that, in each of the analyzed single mutants, HSN is present but shows broad but partial differentiation defects." We apologize for not being clear enough on the role of HLH-3, as also pointed by reviewer #1. 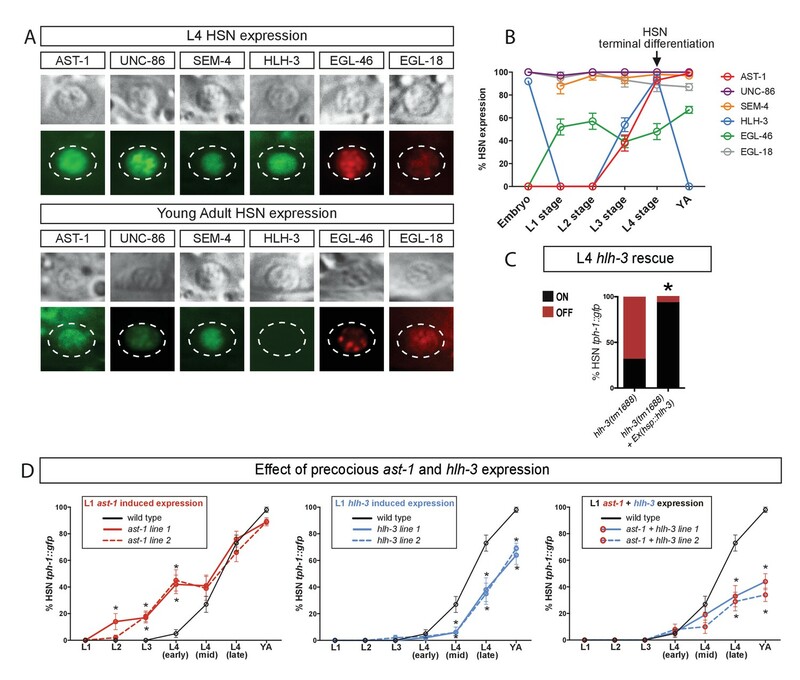 In the revised version of the manuscript we have tried to clarify this issue with additional experiments and re-writing of the section: detailed analysis of hlh-3 expression by GFP fusion to HLH-3 in the endogenous locus (Figure 2—figure supplement 1A) shows that, post-embryonically, HLH-3 starts being expressed in the HSN at third larval stage and its expression is highest at late third larval stage and early forth larval stage, this expression shortly precedes and overlaps onset of expression of most HSN effector genes (Figure 2—figure supplement 1C). We also demonstrate that hlh-3 postembryonic expression in hlh-3 mutants is sufficient to rescue tph-1 expression defects (Figure 2C). Taking into account that we found functional bHLH binding sites in tph-1 and cat-1 CRMs (Figure 5), altogether our data supports the hypothesis that hlh-3 function is directly required to initiate expression of some HSN effector genes. A role for TFs exclusively in initiation but not maintenance has been previously reported. For example, embryonic ttx-3 expression in AIY neuron is dependent on the TF REF-2 but its maintenance of expression does not require REF-2 but TTX-3/CEH-10 activity (Bertrand and Hobert 2009). There are also examples in mouse of TFs required for establishment but not maintenance of cell fate (Bettess et al., 2005, Hoogenkamp et al., 2009, Martins et al., 2005) or required for maintenance but not initiation of expression (Galceran et al., 2001, Harms et al., 2014). HLH-3 belongs to the asc proneural factor family and is ortholog to mouse Ascl1 Figure 2—figure supplement 1D). Ascl1 is expressed in serotonergic progenitors and early postmitotic serotonergic neuroblasts. Besides its role in neuronal progenitors specification it has well-demonstrated roles inducing neuronal differentiation in serotonergic and other neuronal types (Pattyn et al., 2004, Sommer et al., 1995). Ascl1 is also part of the TF combinations used to induce serotonergic fate from human fibroblasts (Vadodaria et al., 2015, Xu et al., 2015). Similar to hlh-3, Ascl1 expression is downregulated from mature neurons. Temporal dysregulation of Ascl1 activity by sustained expression or inhibition of degradation leads to neuronal differentiation defects (Imayoshi et al., 2013, Urbán et al., 2016). Similarly, we observed that precocious and sustained expression of hlh-3 leads to HSN differentiation defects (Figure 2D). hlh-3 function shows additional shared features to Ascl1 like regulation of expression of panneuronal features (see rab-3 expression defects Figure 1E) or being an upstream regulator of egl-46 (Figure 3A) (Ascl1 directly regulates Insm1, ortholog of egl-46) (Castro et al., 2011). Finally, Ascl1 can substitute hlh-3 function in HSN differentiation (Figure 8F). Altogether our new data suggest that in the HSN TF collective hlh-3 acts as a proneural gene in the induction of HSN terminal fate. As suggested by reviewer #3 hlh-3 could be relaying its activity to a downstream TF. Indeed, proneural factors are known to regulate expression of other bHLH TFs that are later required for neuronal differentiation such as NeuroD1 (Guillemot and Hassan 2017). We performed RNAi experiments to knock down the activity of all C. elegans bHLH TFs but we fail to detect either cat-1 or tph-1 expression defects (See attached graphs at the end of the document). As negative results with RNAi are not conclusive we have decided not to include them in the current version of the manuscript. Ascl1 has been shown to act as a pioneer factor to facilitate binding of additional TFs (Wapinski et al., 2013). It would be very interesting to address if HLH-3 can also bind closed chromatin. We have not address this issue in the manuscript because we think it is out of the scope of the paper, the main message of the paper is the identification and characterization of HSN TF collective as a whole, our ability to predict HSN enhancers and the phylogenetic conservation. We believe that a more detailed analysis on HLH-3 function as proneural factor is a project on its own for future manuscripts. This data is now explained in the subsection “AST-1 acts as temporal switch for HSN maturation” and Figure 2 and Figure 2—figure supplement 1. - In Figure 2E, can the authors really decide on the fate maintenance based on one marker? Moreover, most of the TFs have a very minimally (although significantly) penetrant effect. We thank the reviewer for this excellent suggestion and agree that additional markers should be added. We have now included cat-1 expression defects by RNAi (Figure 3C) as well as temperature shift experiments performed with temperature sensitive alleles for ast-1, sem-4 and unc-86 (Figure 3—figure supplement 1). Do they believe that the egg-laying defect is because of this effect? Could it be that this mutant is affecting other cell types that are causing the egg-laying defects? We thank the reviewer for this remark, we have modified the text to try to clarify our results (subsection “HSN TF collective shows enhancer-context dependent synergistic relationships”). Additionally, we have now expanded our double mutant analysis including more double combinations as well as cis-cis and cis-trans double combinations (Figure 6 and Figure 6—figure supplement 1 and Figure 6—source data 2). We now show synergistic relationships in 9 out of the 15 possible HSN TF collective pair combinations. Synergistic effects include examples for all members of the HSN TF collective and it is the most frequent genetic interaction found in our double mutant analysis (Figure 6—source data 2). Thus, although not all combinations of TFs might be able to synergize we find that all HSN TFs show synergistic relationships and that synergy is a very common feature as would be expected for the TF collective model. Nevertheless, as stated by reviewer # 3 our data show a complex scenario that cannot be put in a model or used to make predictions or extrapolations, in fact, this is an important message of this part of the manuscript: we find different types of genetic interactions for every reporter gene and for different combinations of TFs pairs indicating there is not a general rule. We apologize if this was misleading, now we have change the text to try to clarify this point. We think this data is very informative. Despite the fact that these TFs act as a collective, they work in such a flexible way that interactions among them are determined specifically by the enhancer context they bind to. As for the second part of the remark by the reviewer, the use of mutant alleles showing low penetrance is a requirement to be able to unravel genetic interactions. Strong phenotypes would not allow us to detect synergy or additivity. We thank CGC (P40 OD010440) for providing strains. Dr Oliver Hobert, as initial experiments were performed in his laboratory and for sharing unpublished data. Dr Oscar Marín and Dr Beatriz Rico labs for scientific discussion. Elia García, Vicent Puig and Benito Alarcón for technical help. Dr Alberto Marina, Rafa Ciges and Dr Marta Casado for help with protein purification and EMSAs, Dr Iñaki Comas for sharing server space, Dr Mario Sendra for statistics advice, Life Science Editors for manuscript editing and Dr Esteban Mazzoni, Dr Luisa Cochella, Dr Inés Carrera, Dr Carlos Estella, Dr José Penadés and Dr Oscar Marín for comments on the manuscript. Animal experimentation: All experiments were performed according to the animal care guidelines of the European Community Council (86 ⁄ 609 ⁄ EEC) and to Spanish regulations (RD1201 ⁄ 2005), following protocols approved by the ethics committees of the Consejo Superior Investigaciones Científicas (CSIC). © 2018, Lloret-Fernández et al.